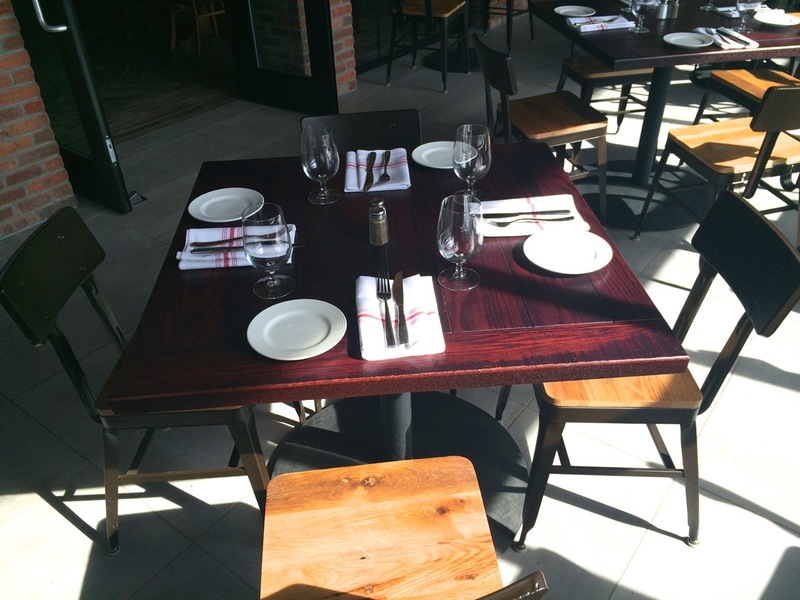 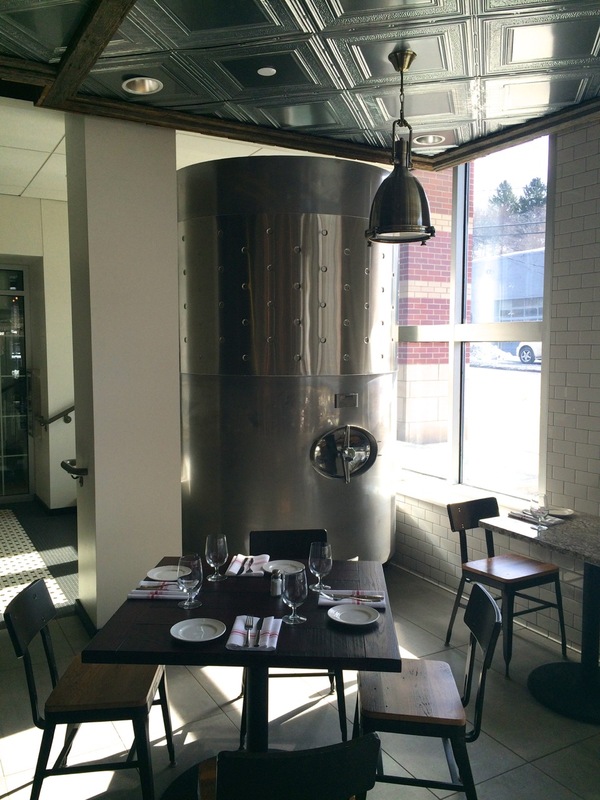 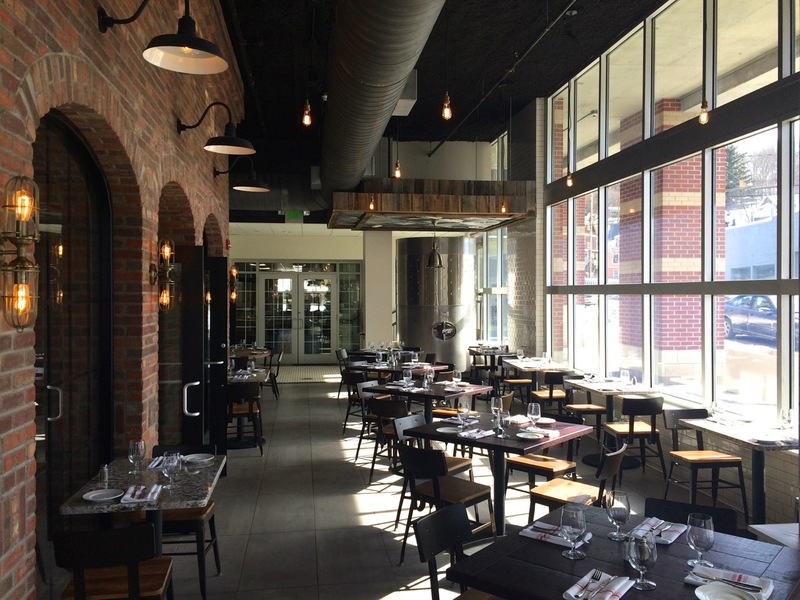 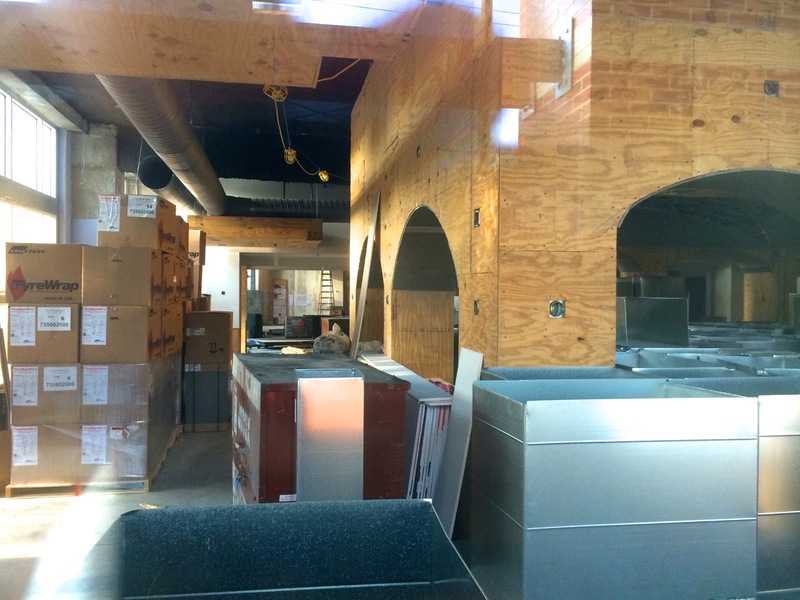 I had a chance to swing by the Coltivare Culinary Center and Restaurant downtown a few weeks ago, so here are some interior shots of the finished product, opened-up in December of last year. 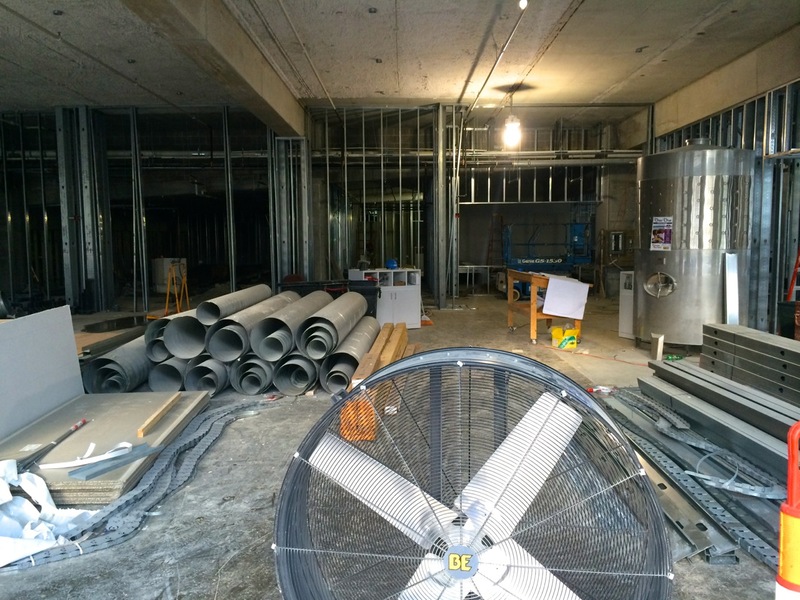 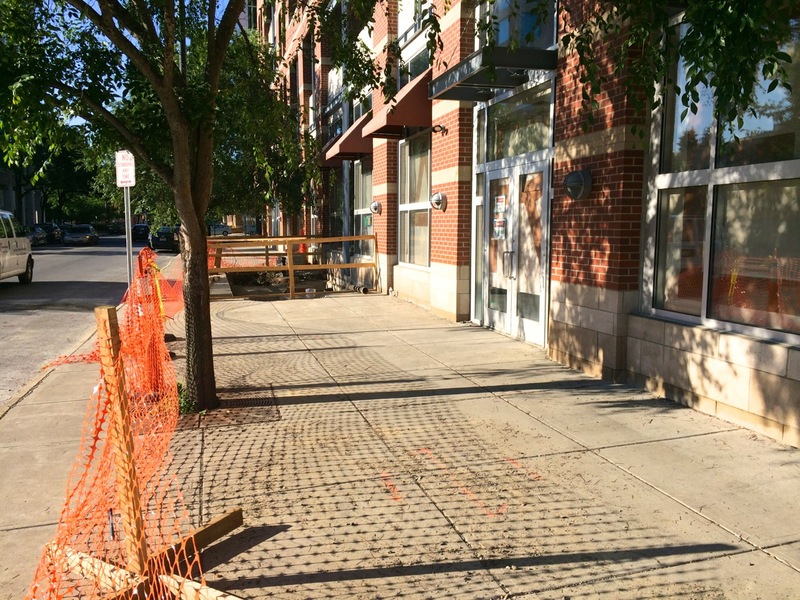 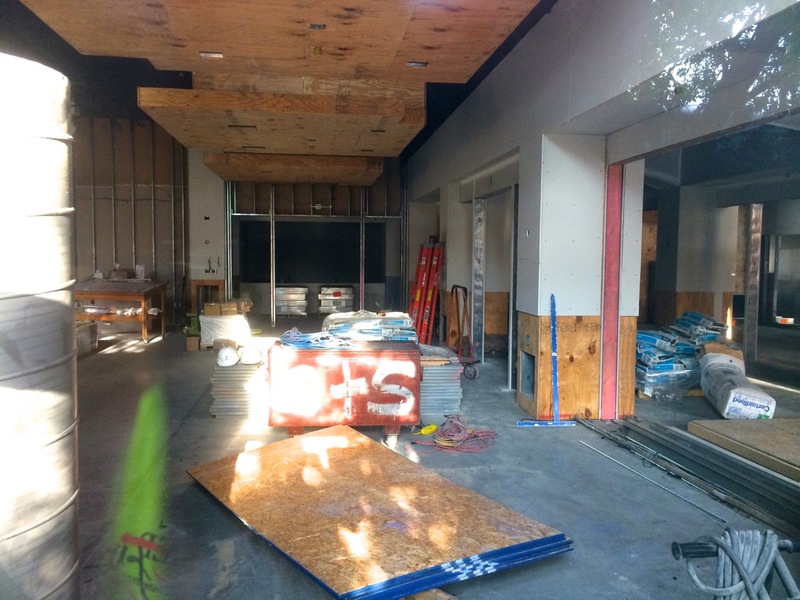 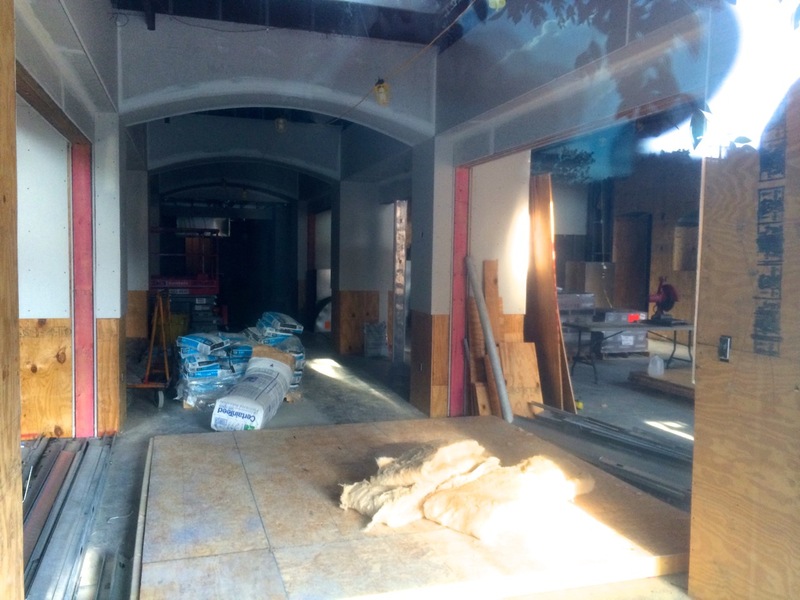 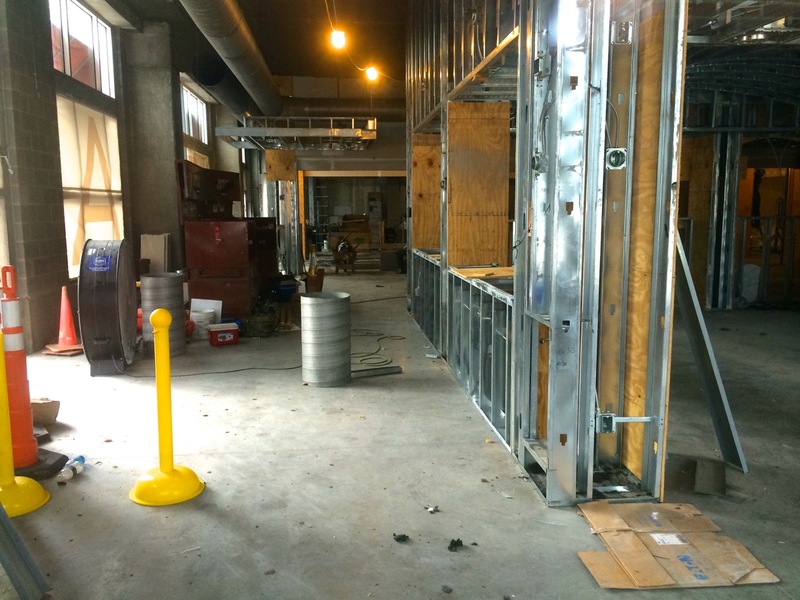 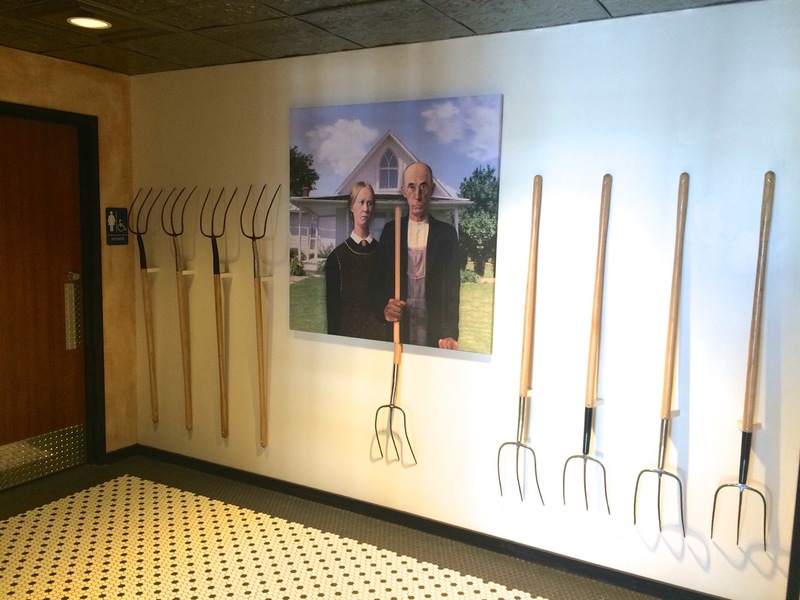 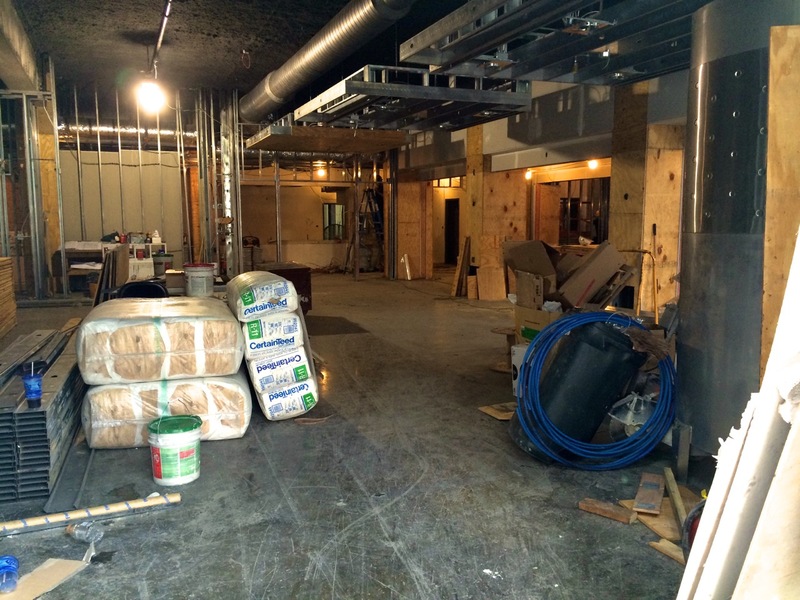 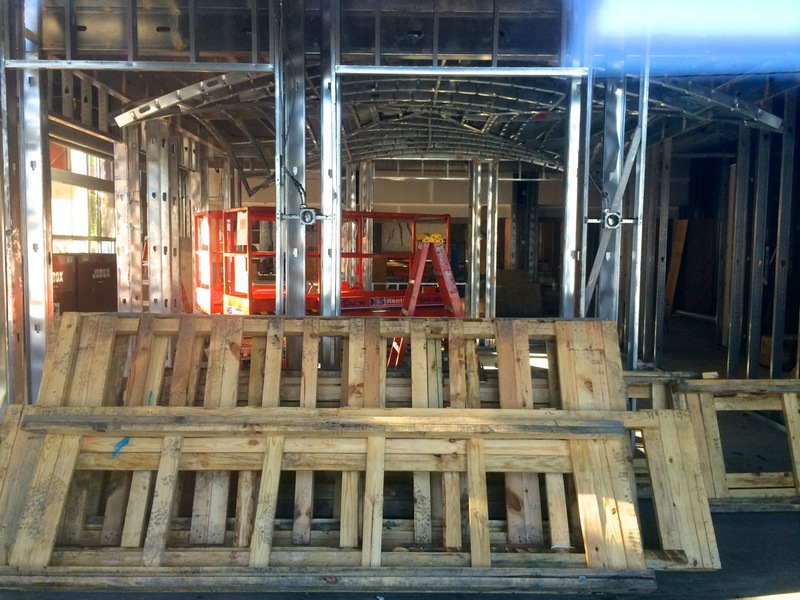 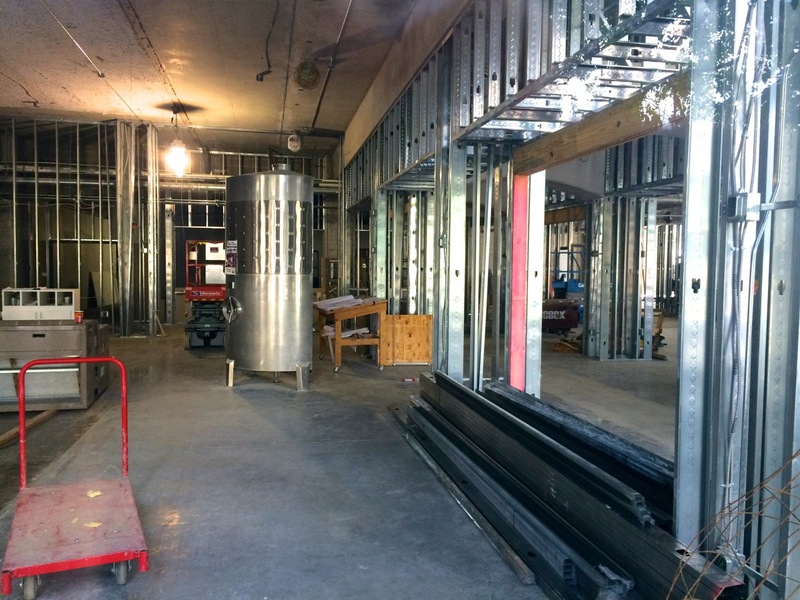 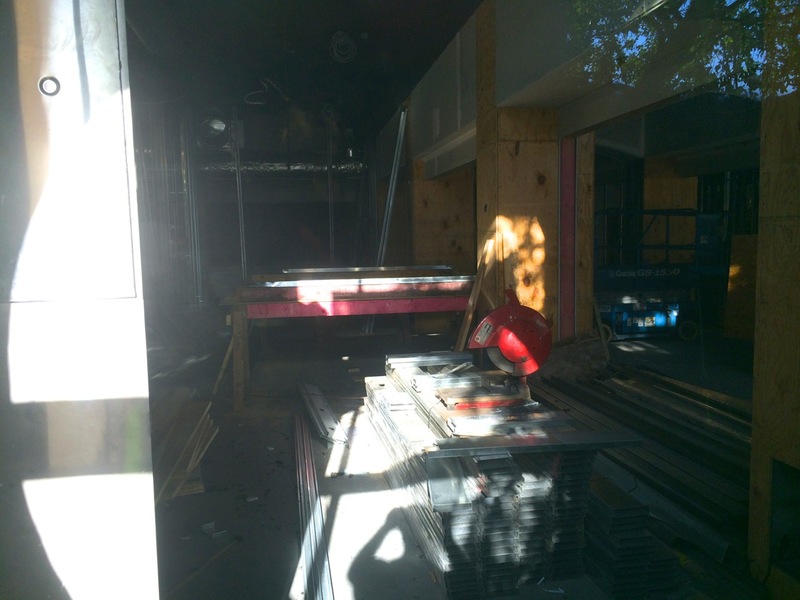 TC3 announced the project as part of its Farm-to-Bistro education program in late 2013/early 2014, and plumbing and framing work began on the space in May, 2014. 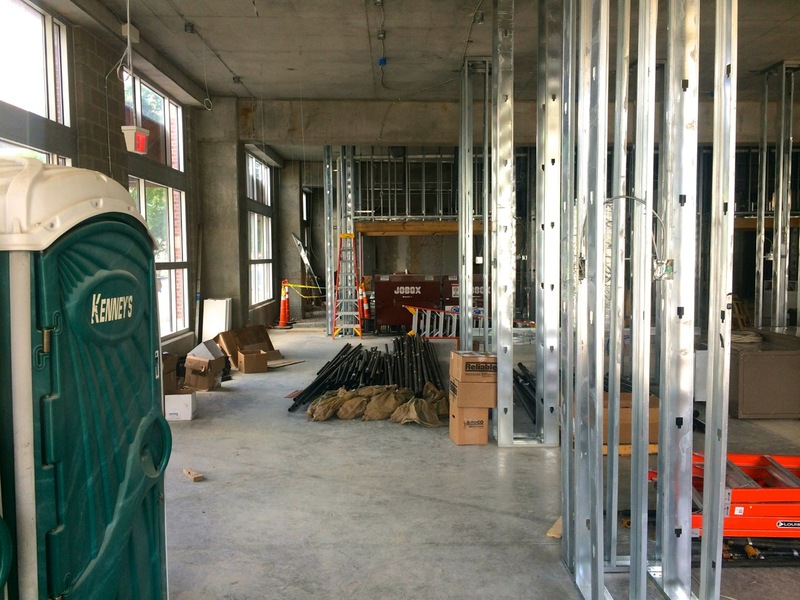 The interior spans 17,000 square feet with a bar, public restaurant, full kitchen, cooking lab, teaching lab, a lounge with offices and restrooms, and two large assembly areas for events split by a vertically-collapsible folding wall. 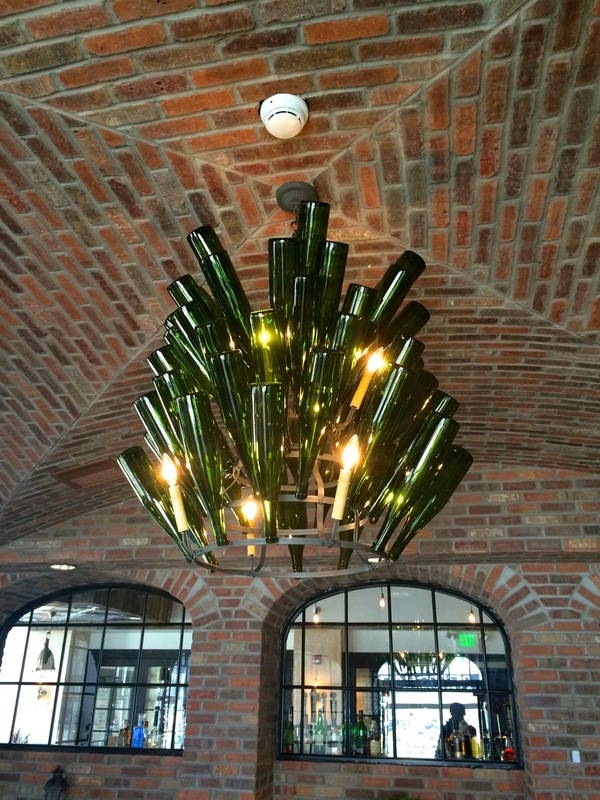 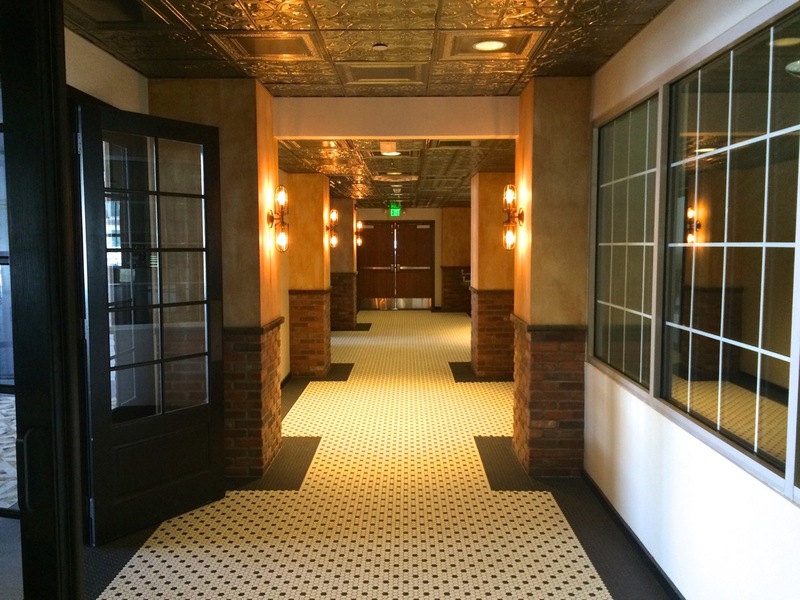 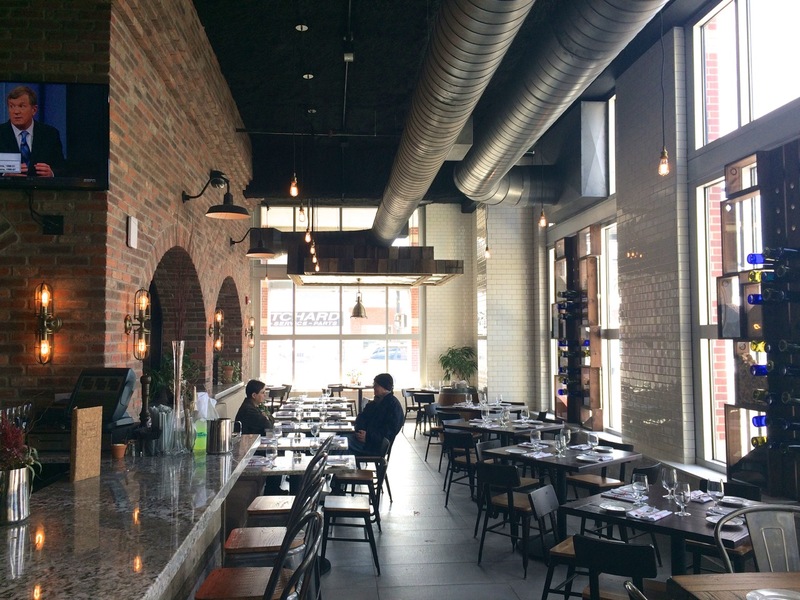 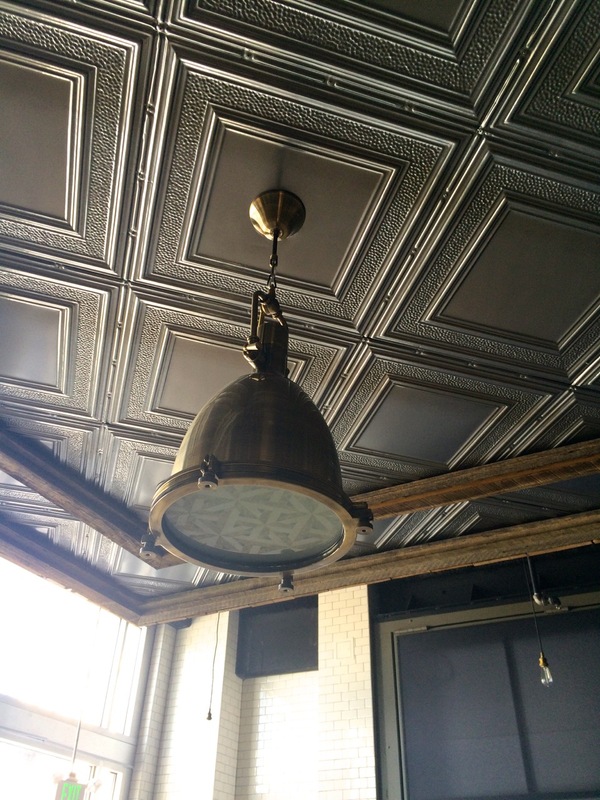 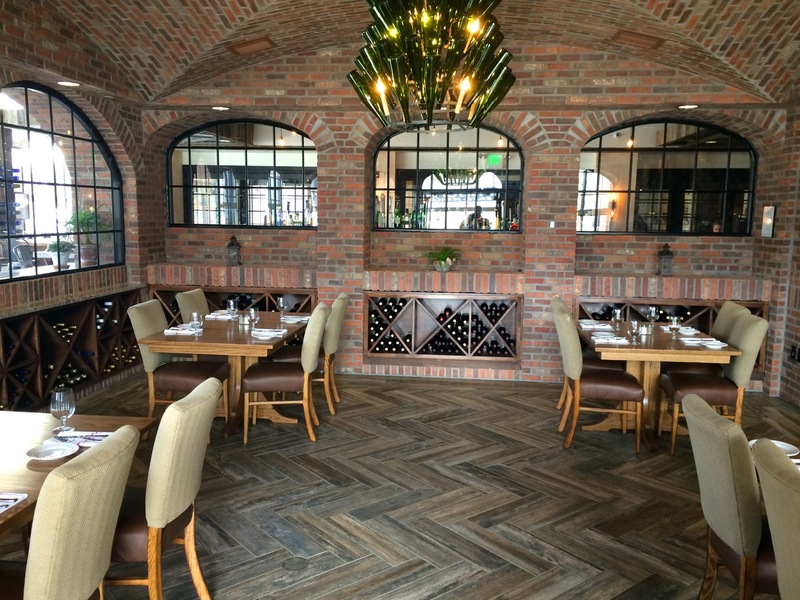 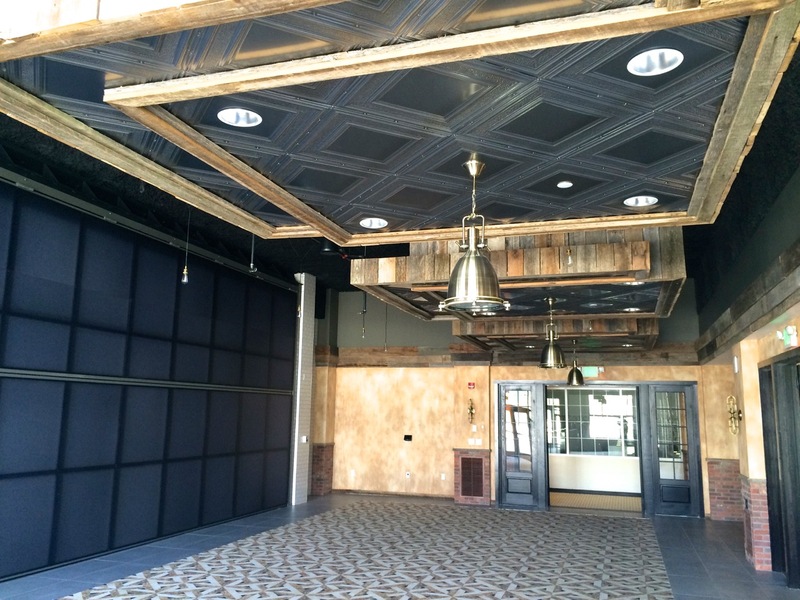 The interior finishes are varied: brick veneer, tile, composite/rubber, and painted walls; tile, wood, and carpeted flooring; and interesting finishes, like the reclaimed wood-trimmed and tin-panelled ceiling clouds, and filament bulbs. 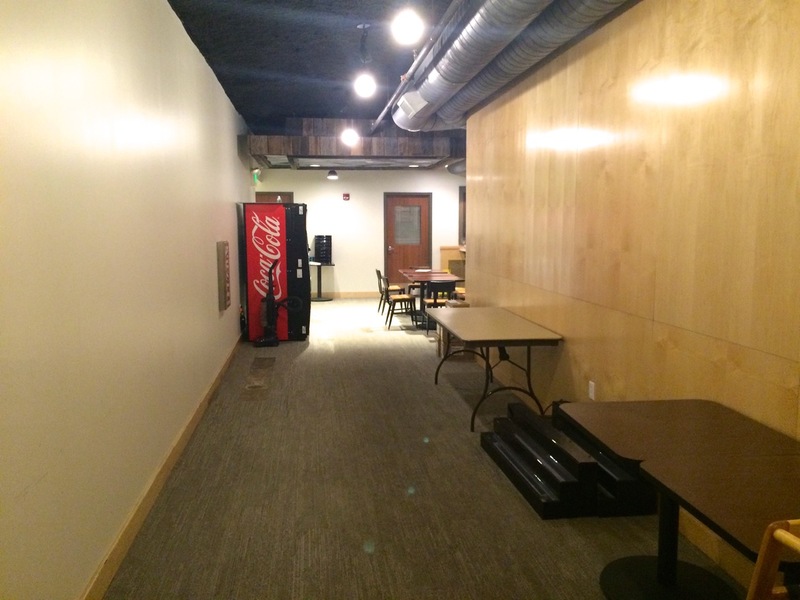 It’s quite a cool space. 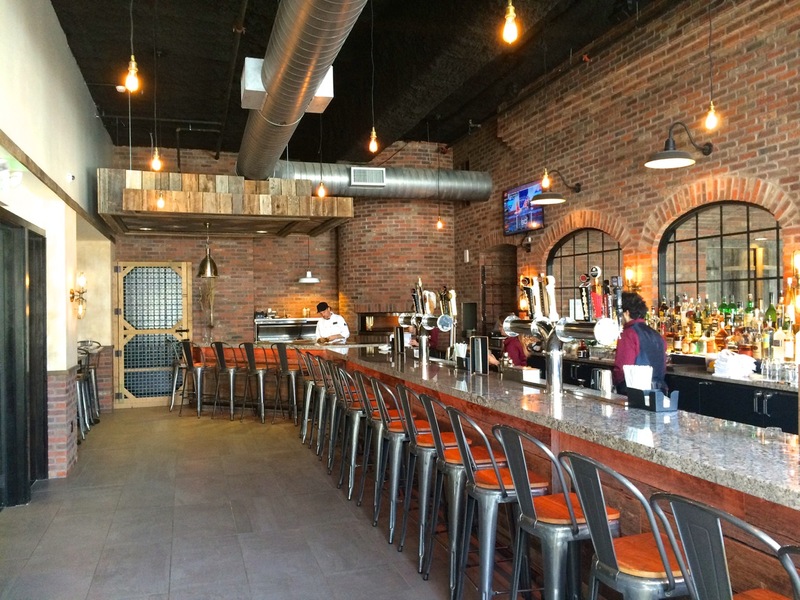 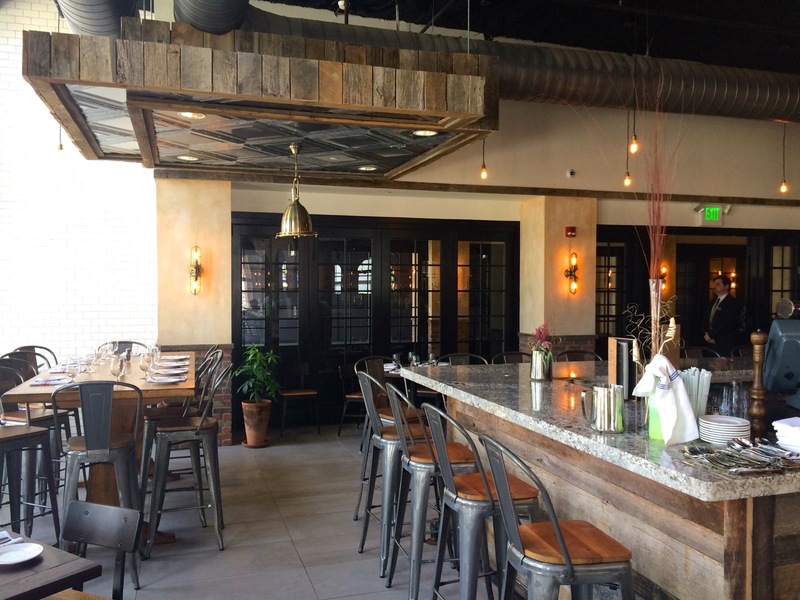 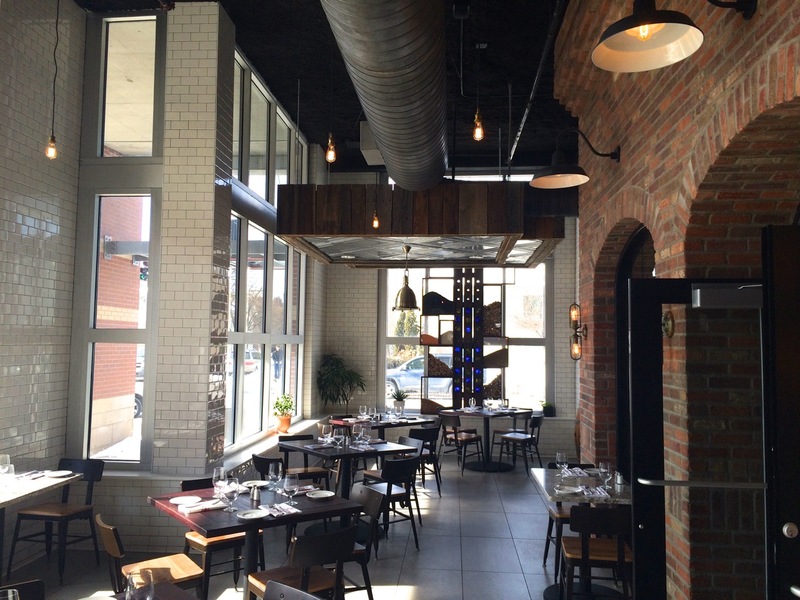 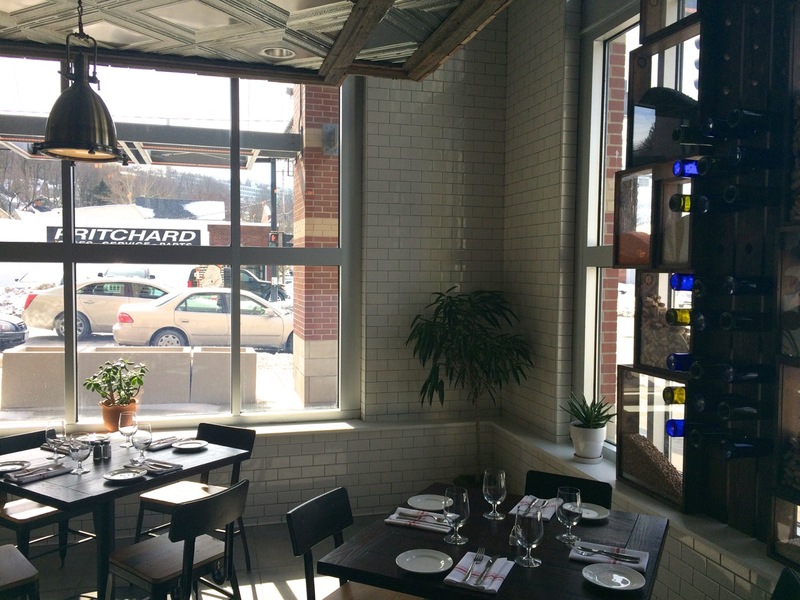 The interior design was done by Ramsgard Architectural Design, with construction by Turnbull-Wahlert Construction out of Cincinnati, Ohio, the same firm that is building the Lofts@SixMileCreek project for Bloomfield/Schon + Partners behind the building. 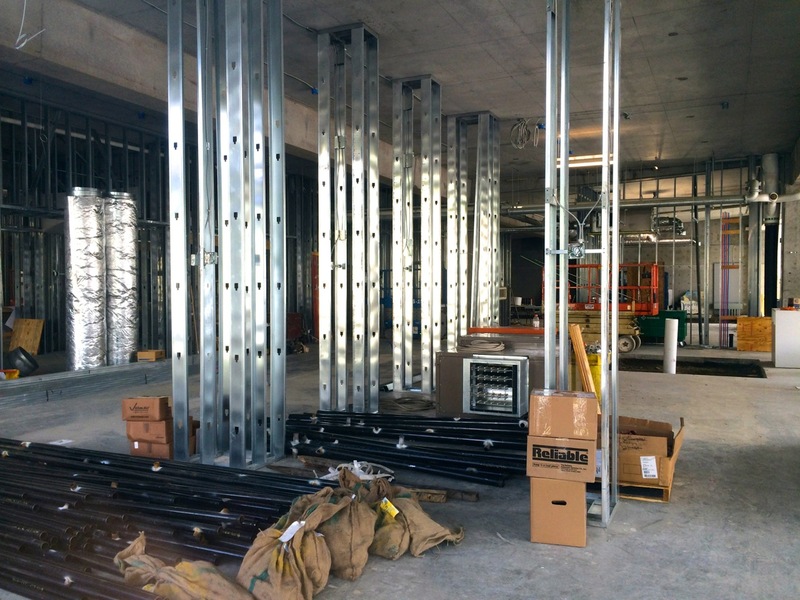 42 days and counting down as of this post: TC3’s 17,000 square foot Coltivare project for the Farm to Bistro Program is continuing progress, with more wall and flooring finish installations, interior storefront windows and doors, HVAC ductwork, kitchen appliance finishes, various electrical and lighting, and drop ceilings. 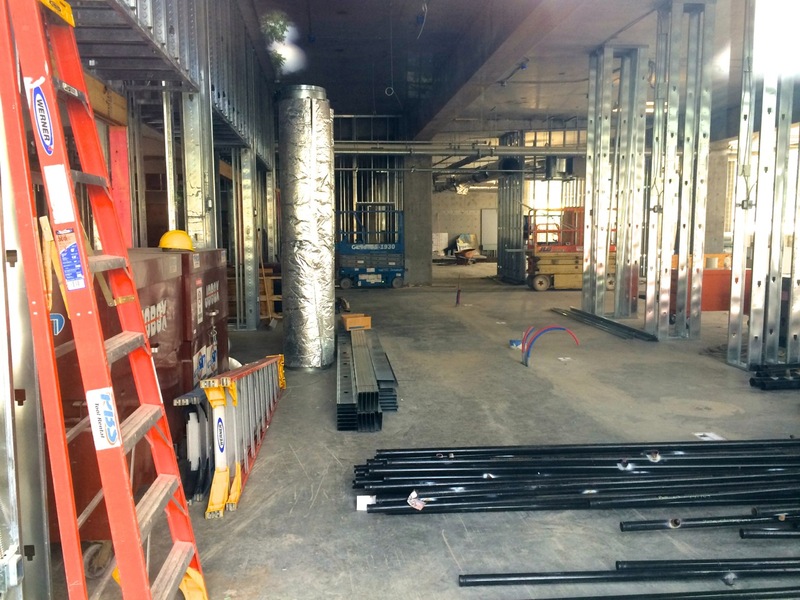 The space will house a public restaurant, full kitchen, cooking lab, and a lounge with offices and restrooms. 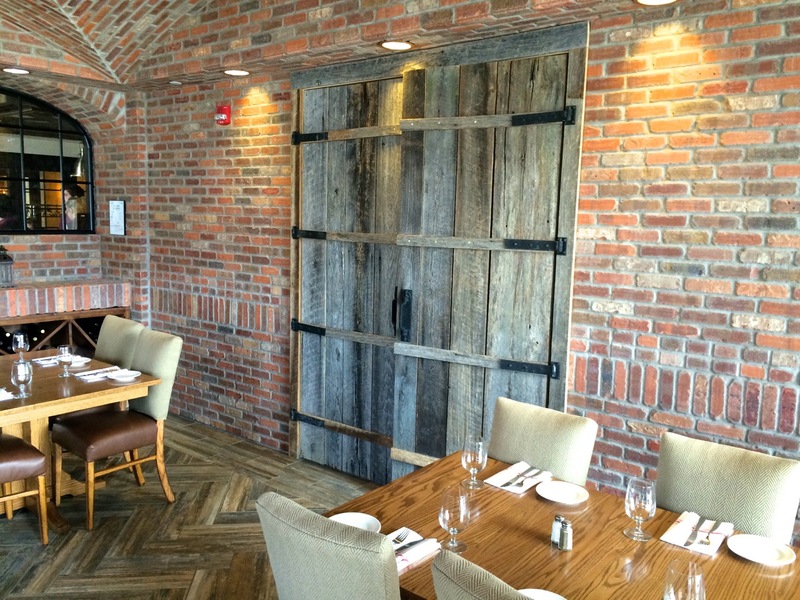 Design by Ramsgard Architectural Design, with construction by Turnbull-Wahlert Construction. 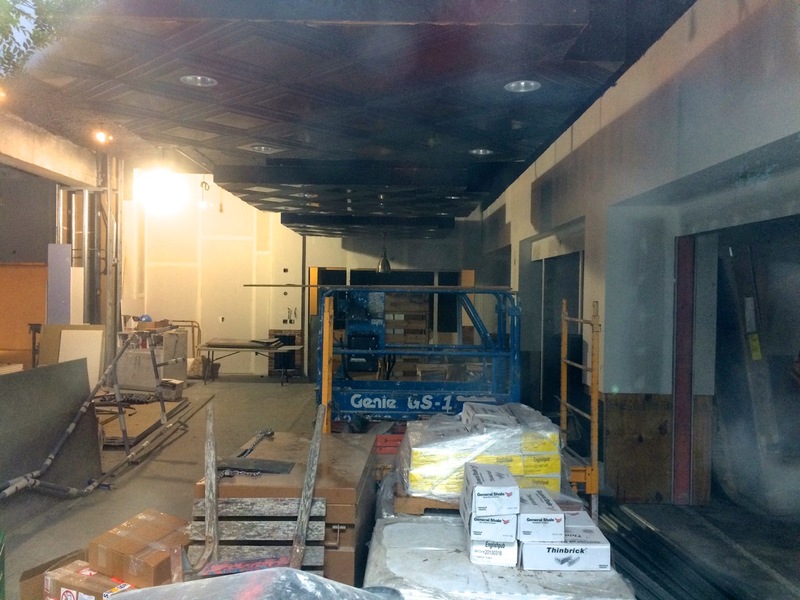 As far as I know, it’s still due to open this Fall, and the past few weeks have shown some nice progress: more drywall has been hung, tile floors have been installed in the cooking classrooms, on many of the walls (along with steel sheets and brick veneer), and the hoods and venting have been secured and wrapped on the interior. 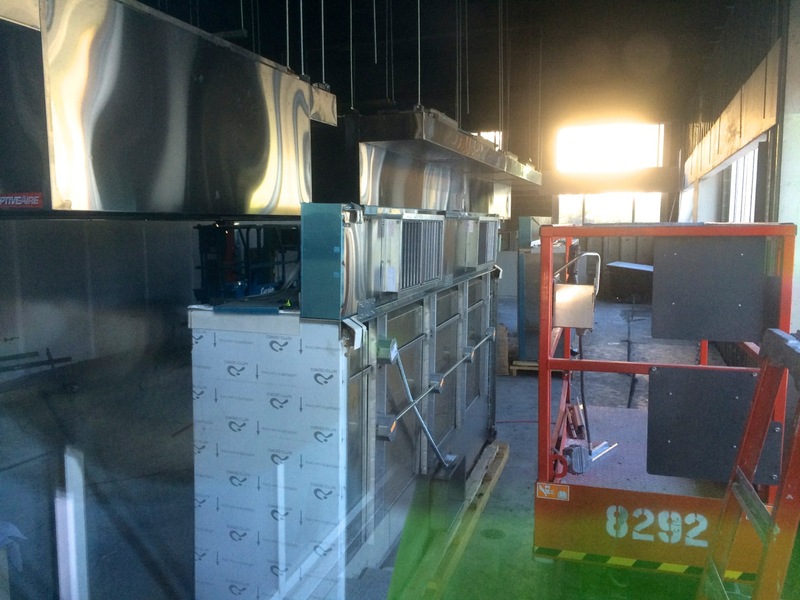 The exhaust and makeup air ducting is vented out the back, with units located on the garage floor above. 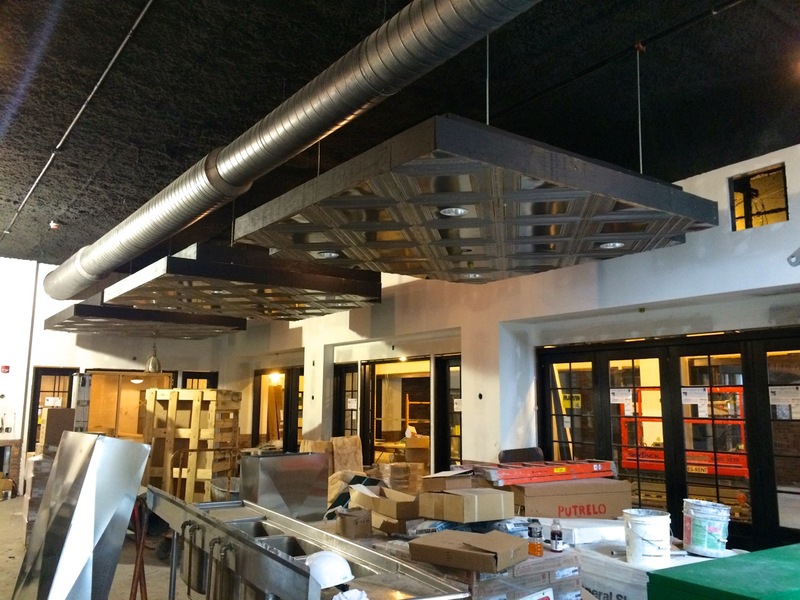 Ceiling grids are going in, and there are a bunch of plywood-sheathed ceiling clouds constructed from steel stud frames, now wrapped in a ceiling panel product. 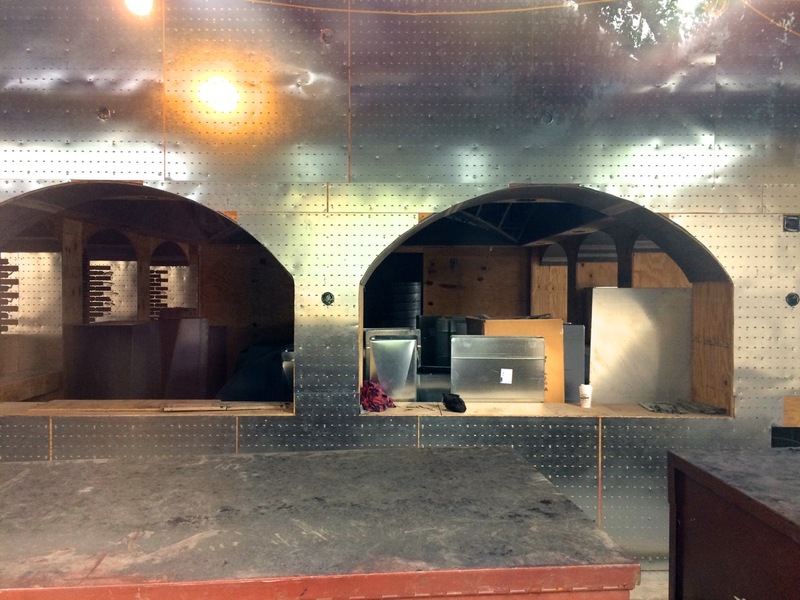 Should be a cool interior once it’s all set. 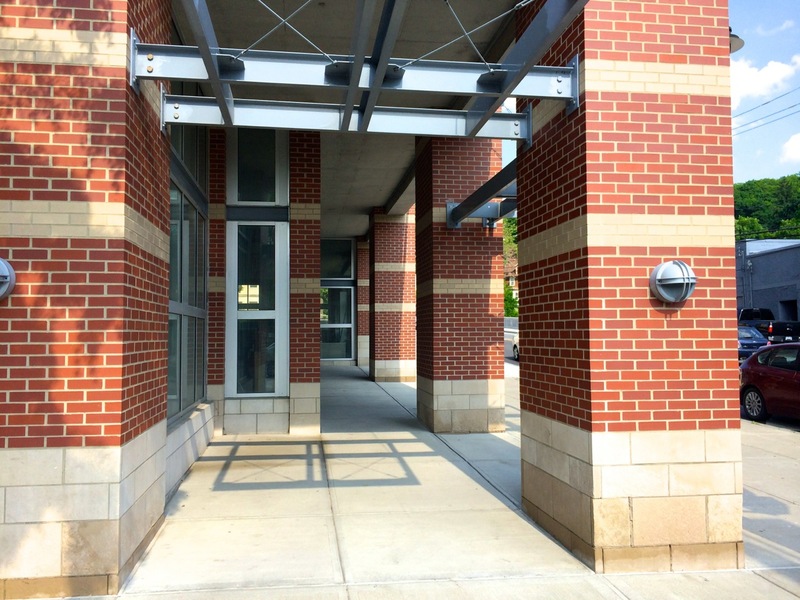 Design by Ramsgard Architectural Design, with construction by Turnbull-Wahlert Construction. 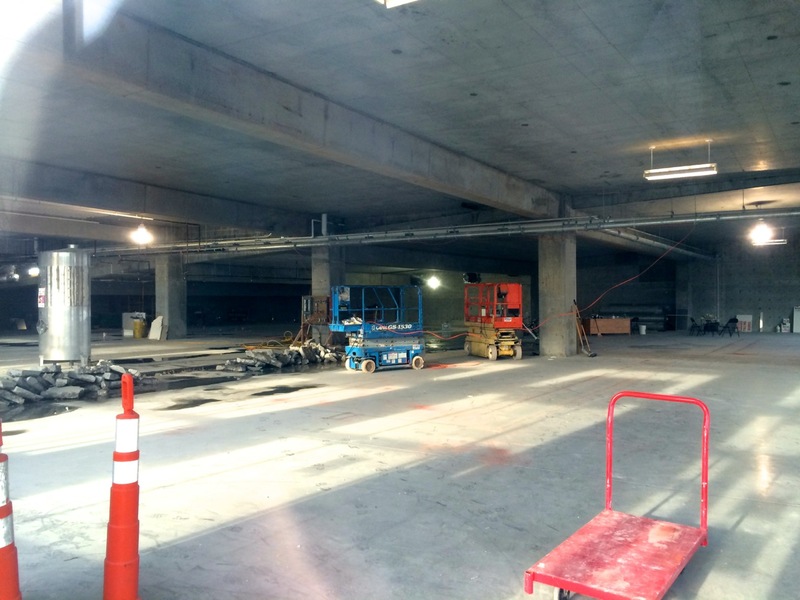 Here are some updated photos for TC3‘s 17,000 square foot Coltivare project in the ground floor of the Cayuga Street Garage downtown. 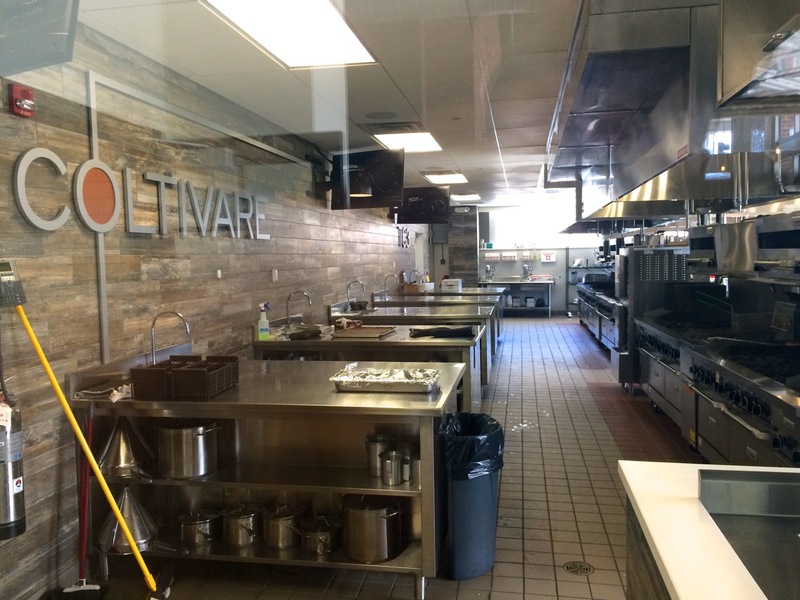 There’s also a good set from August 7th on Coltivare’s Facebook page. 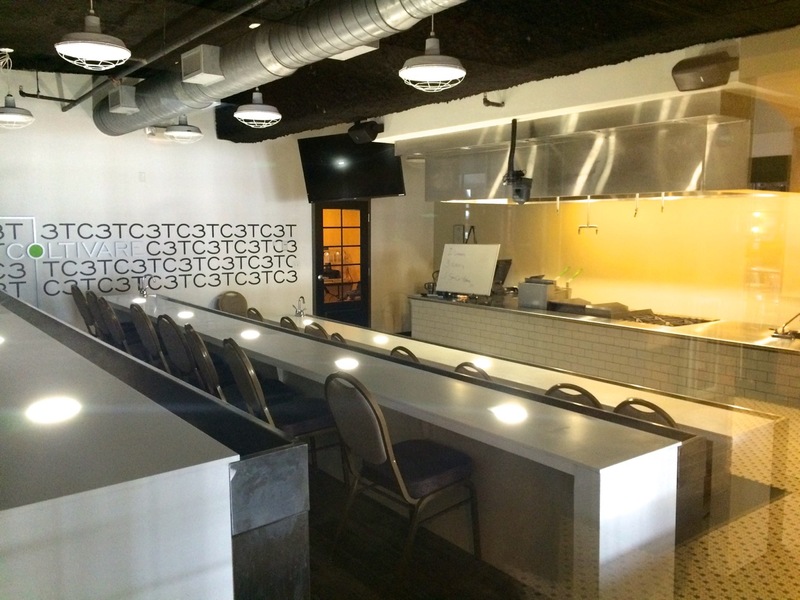 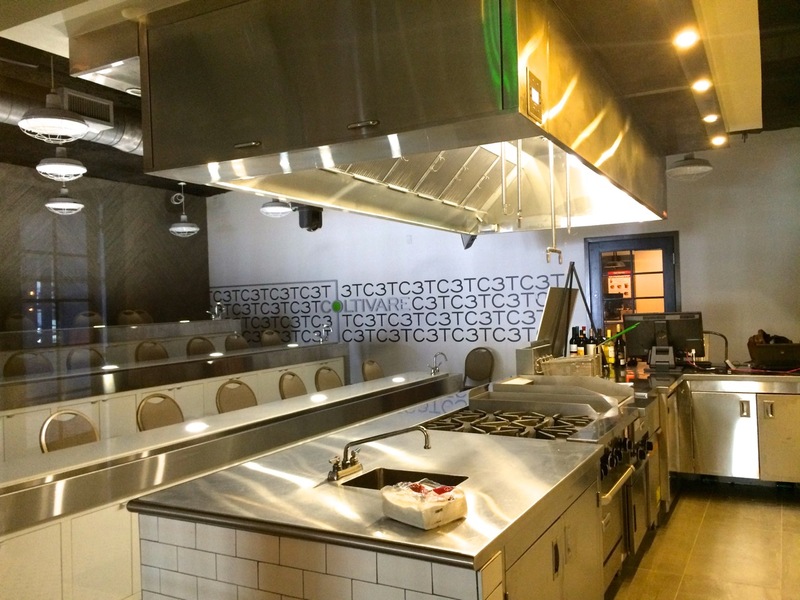 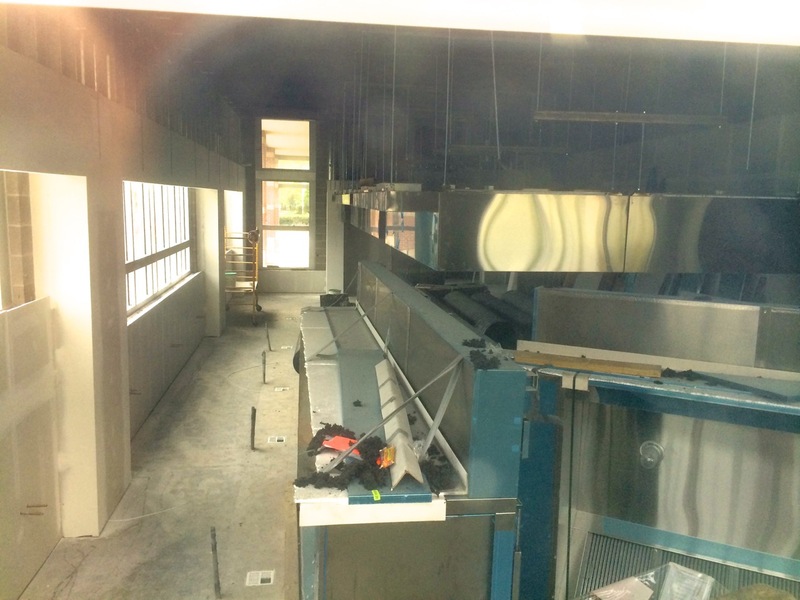 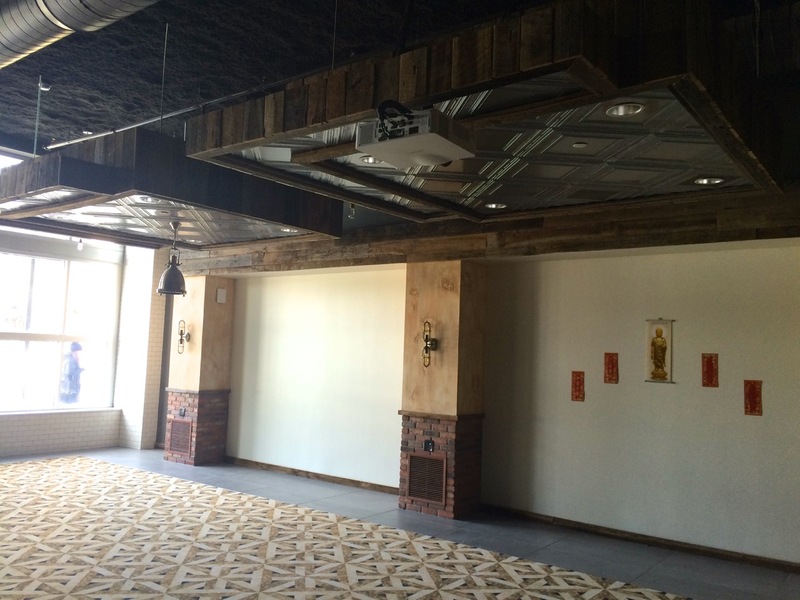 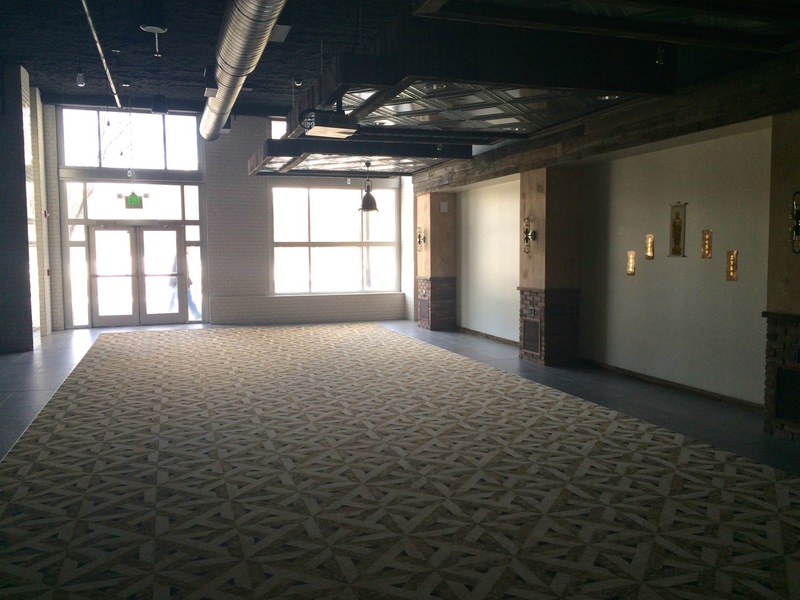 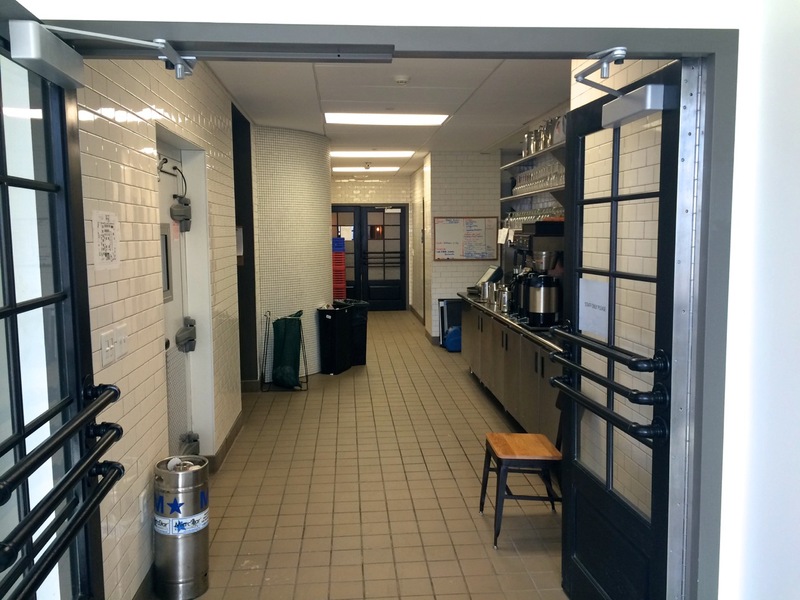 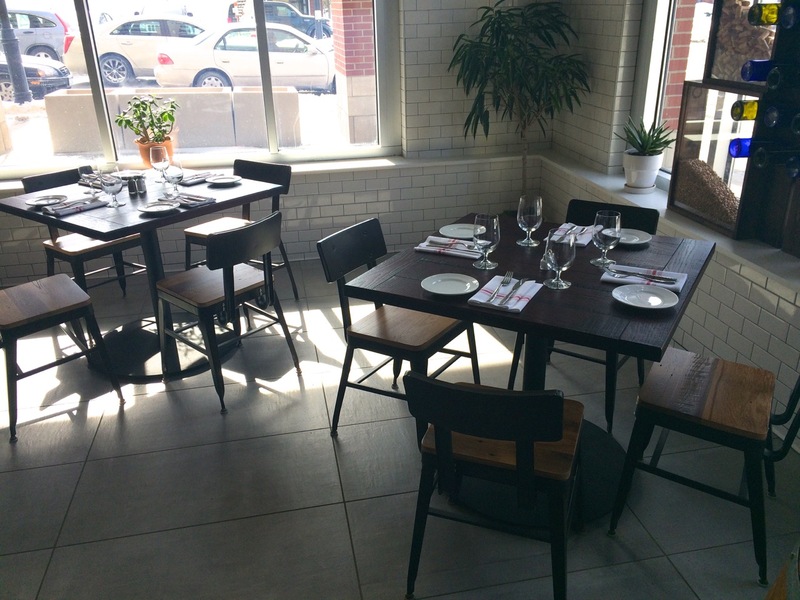 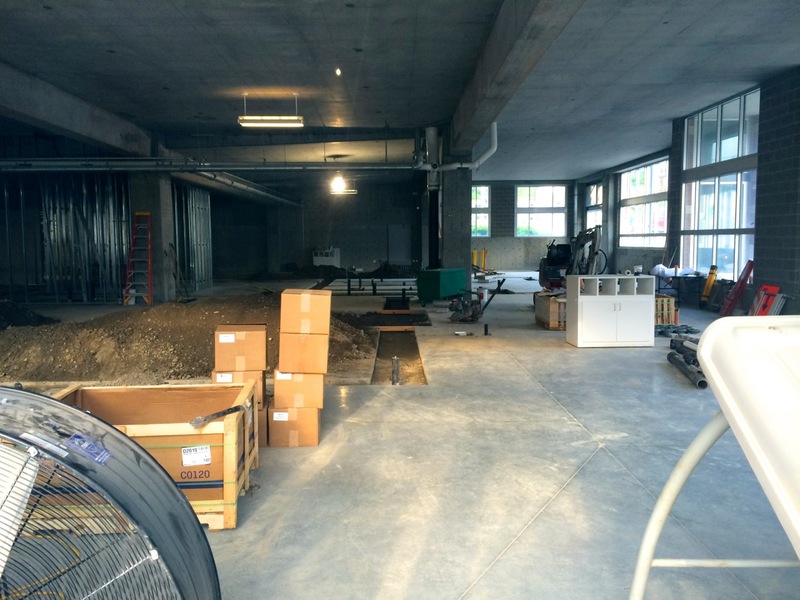 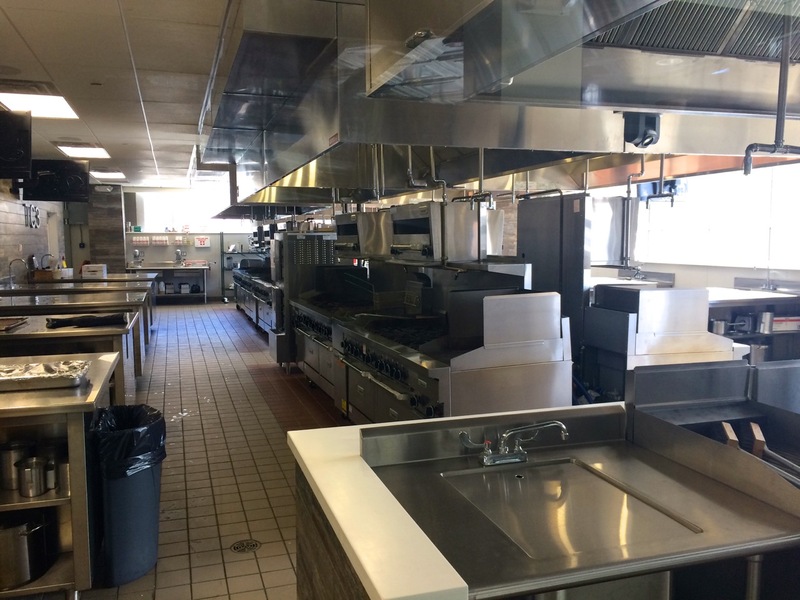 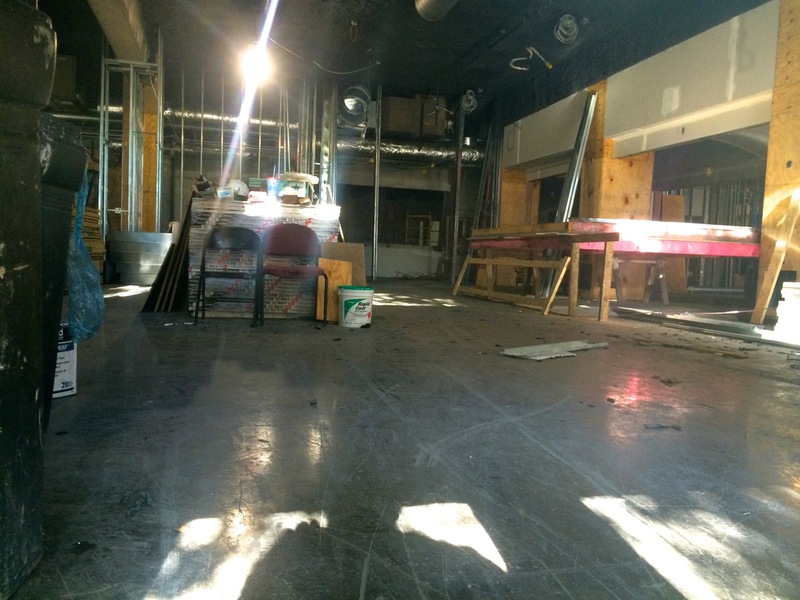 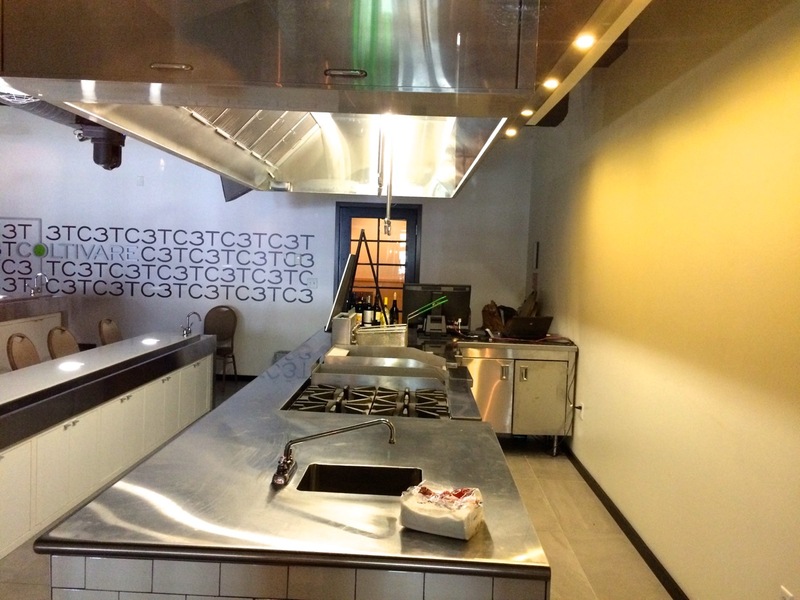 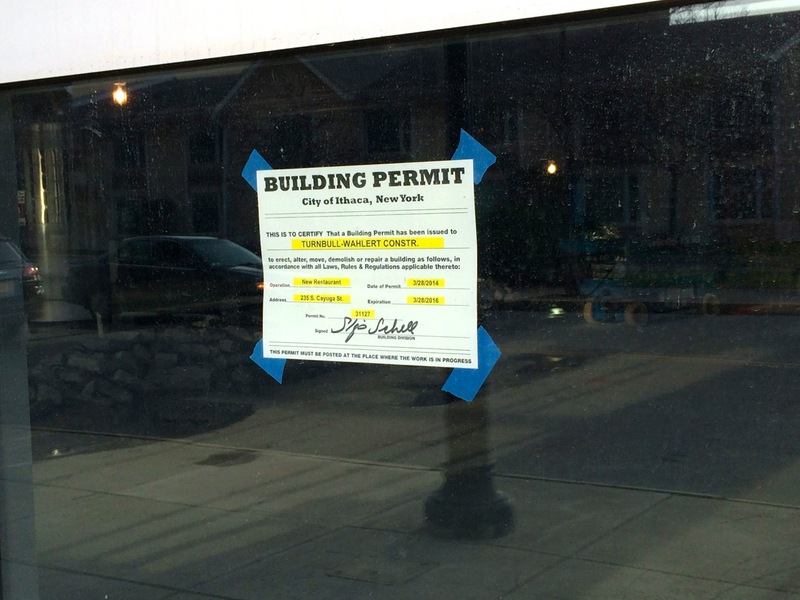 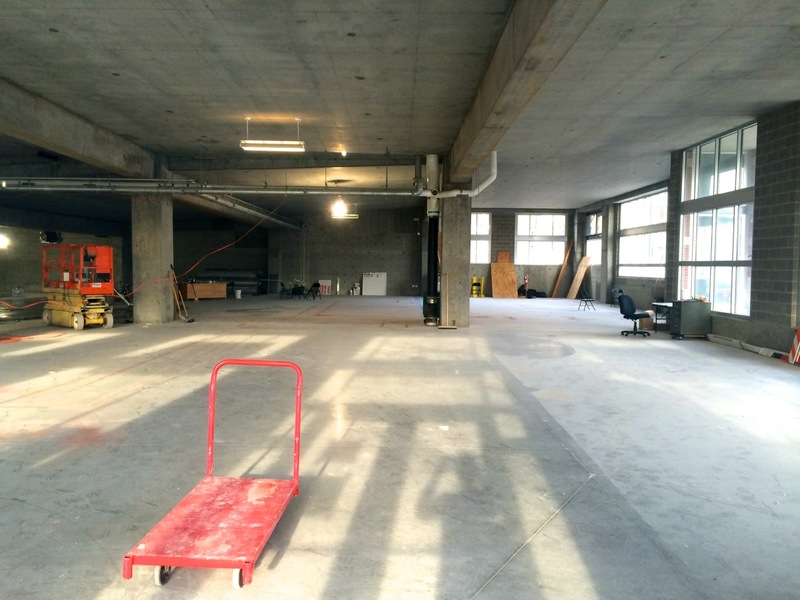 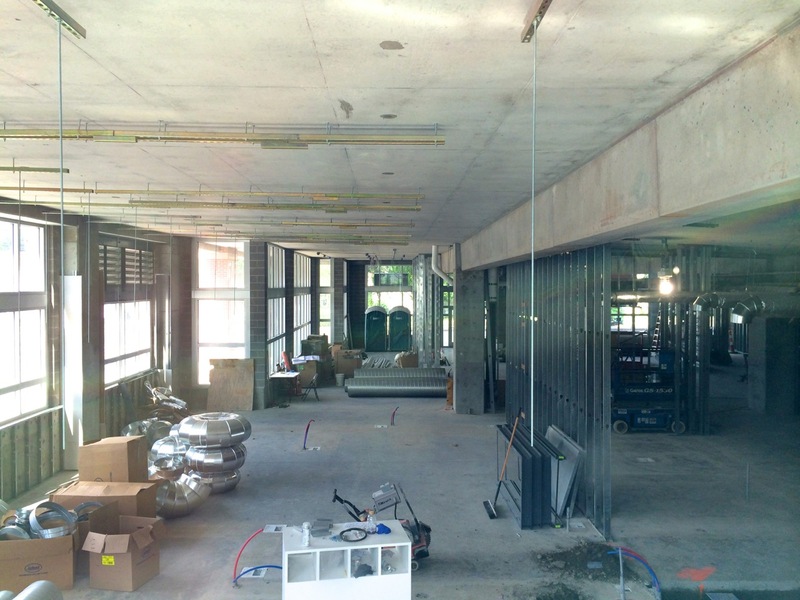 The space will be used as a restaurant and classroom for TC3’s new Farm-to-Bistro Program. 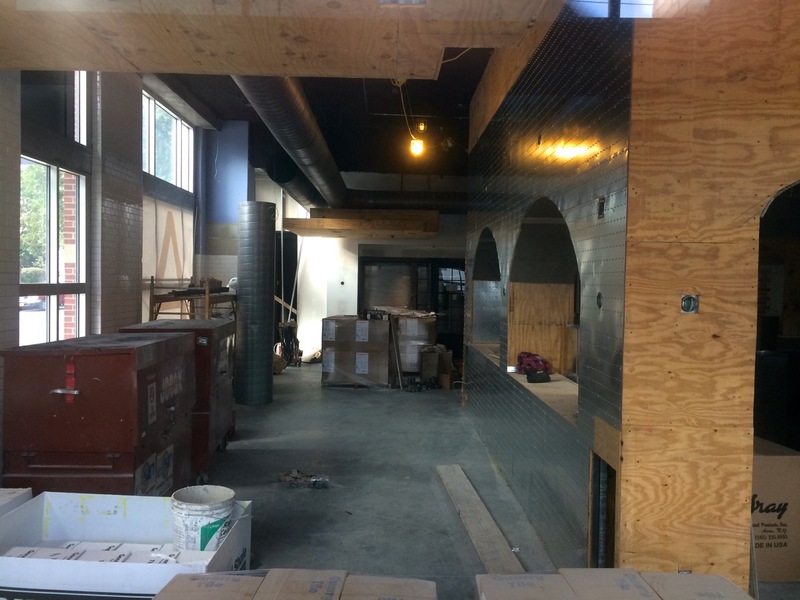 The plan was to open in early September, but it looks like they’re now targeting some time in November, based on the countdown at the new Coltivare website. 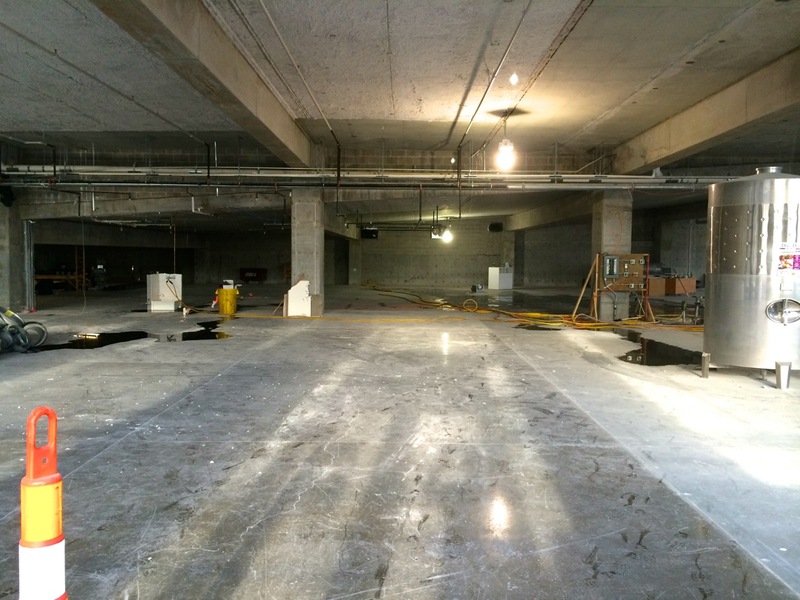 A complex space such as this is, construction delays are understandable. 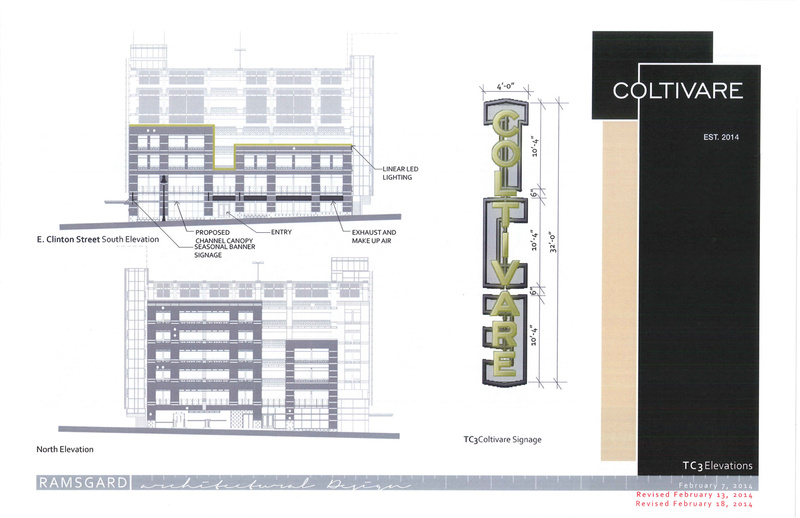 A new signage render was released last month, along with a final floor plan, embedded below. 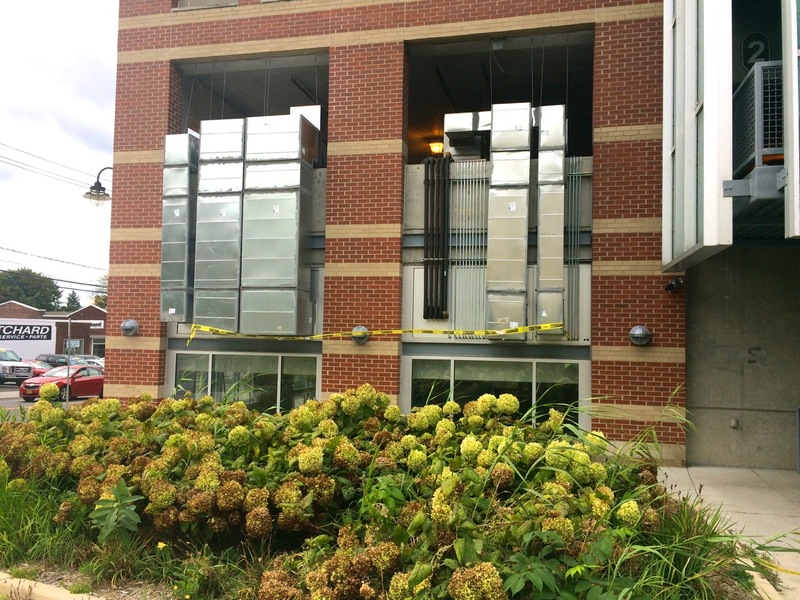 Construction by Turnbull-Wahlert (see Cayuga Place Residences Project by Bloomfield/Schon + Partners), and design by Ramsgard Architectural Design. 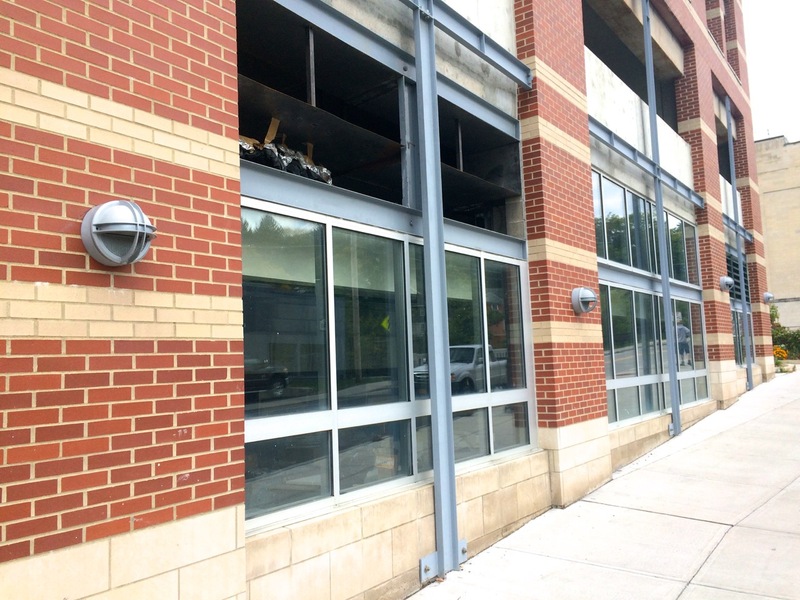 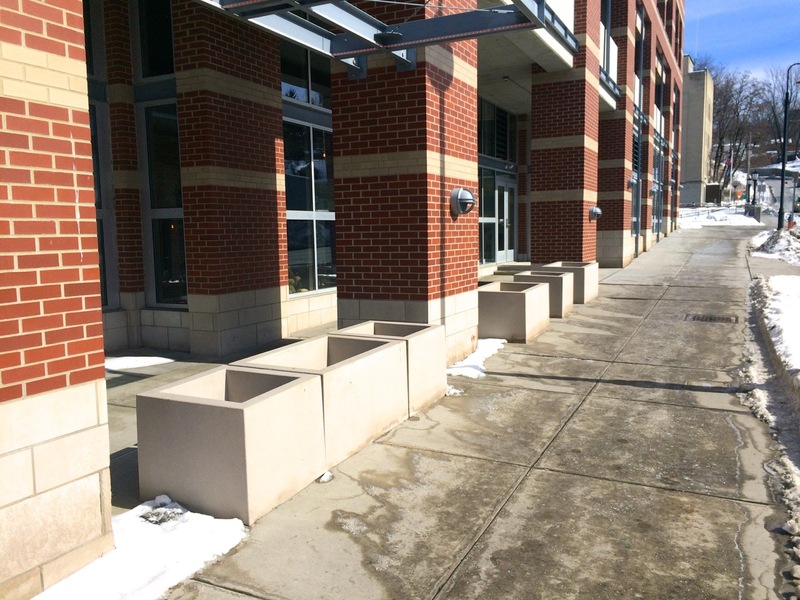 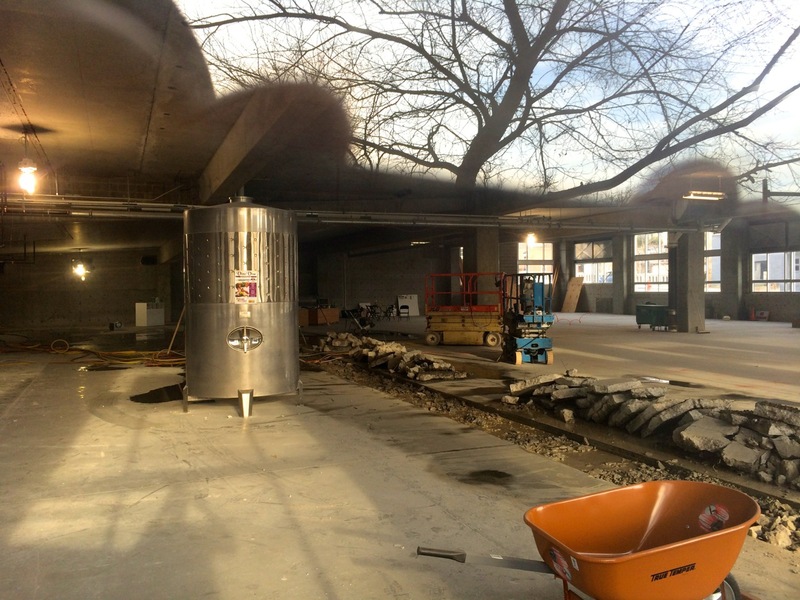 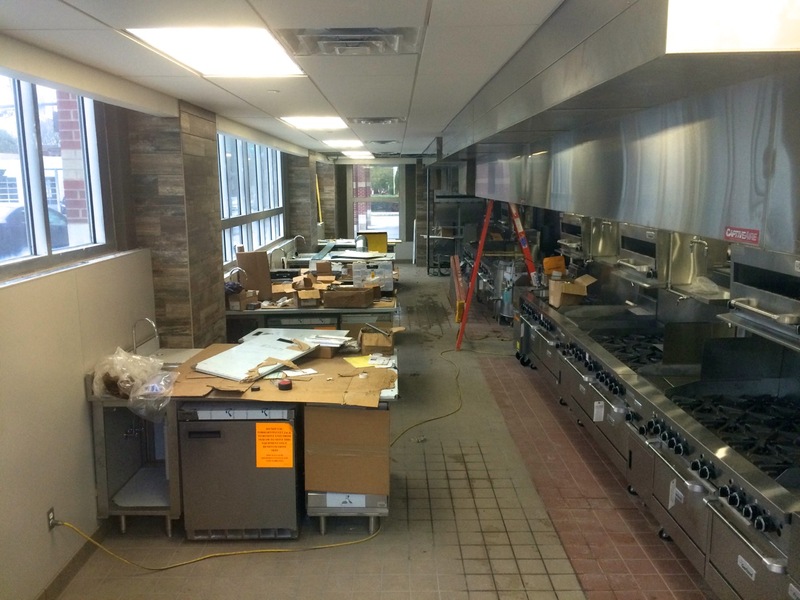 The Tompkins Cortland Community College 17,000 square foot Coltivare Project has been making progress in the ground floor of the Cayuga Street Parking Garage, as the newly-formed Farm-to-Bistro Program plans to make use of the space this coming semester once the space is complete. 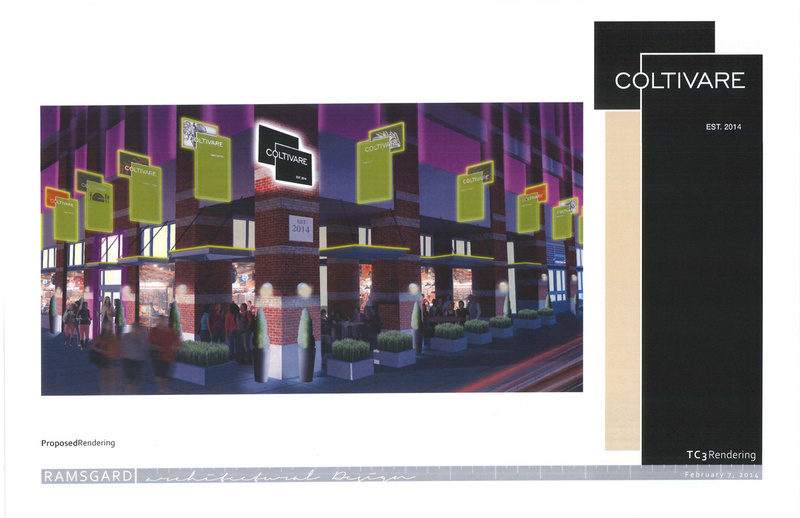 Some new signage plans were released, along with a floor plan of the space below. 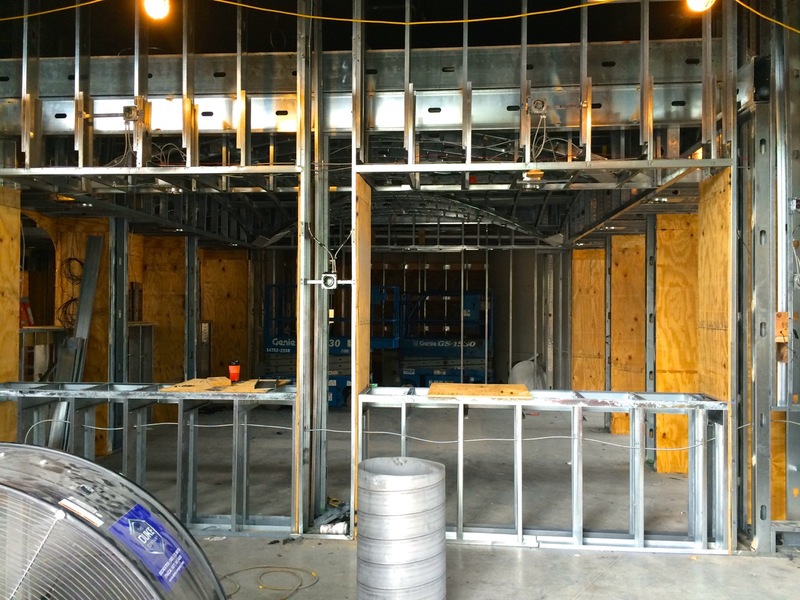 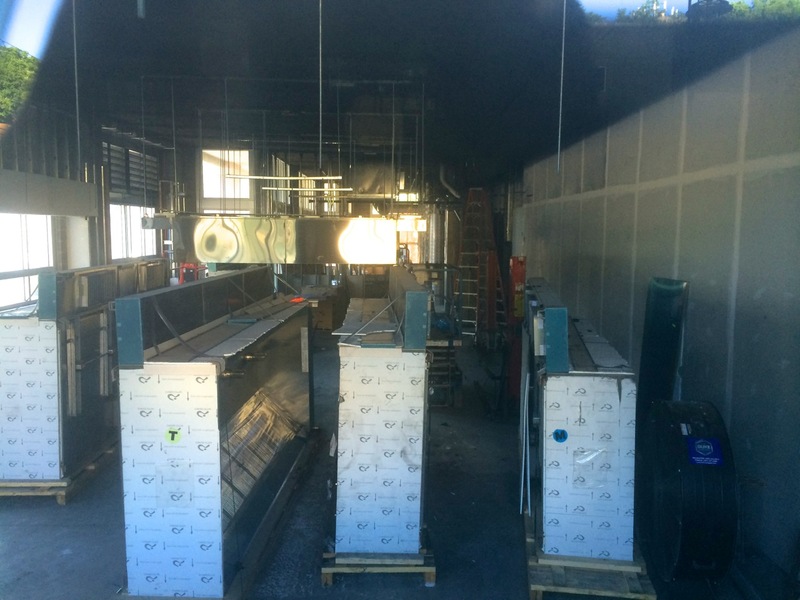 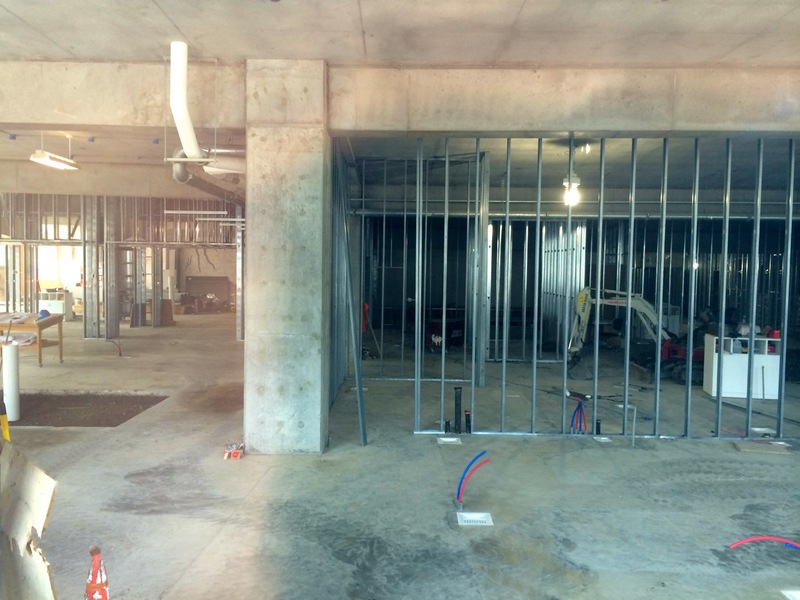 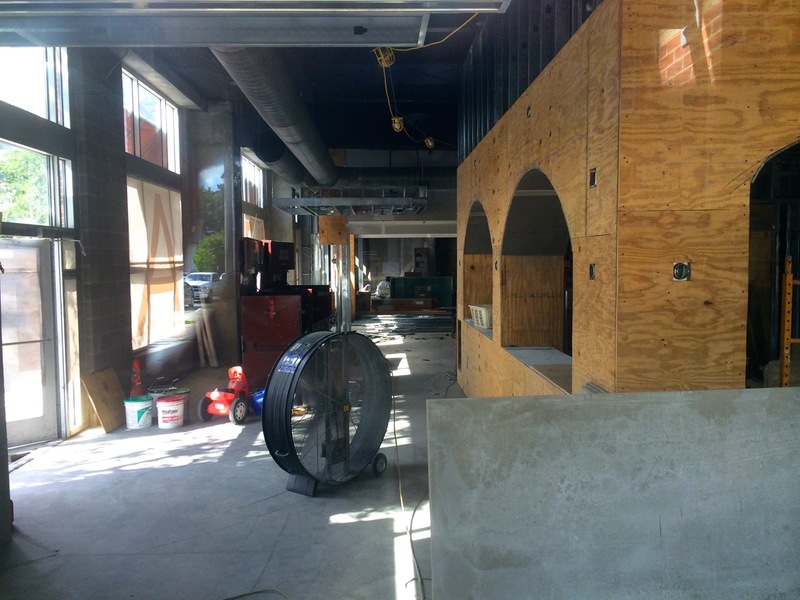 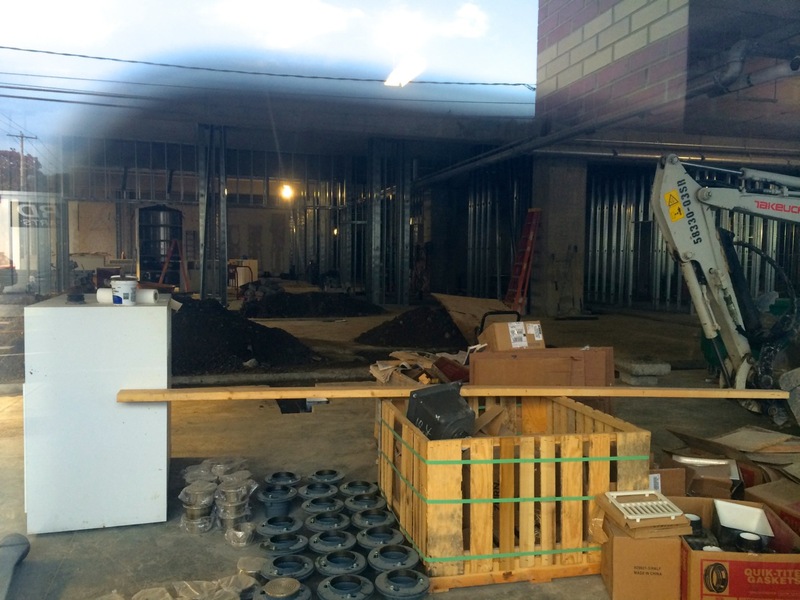 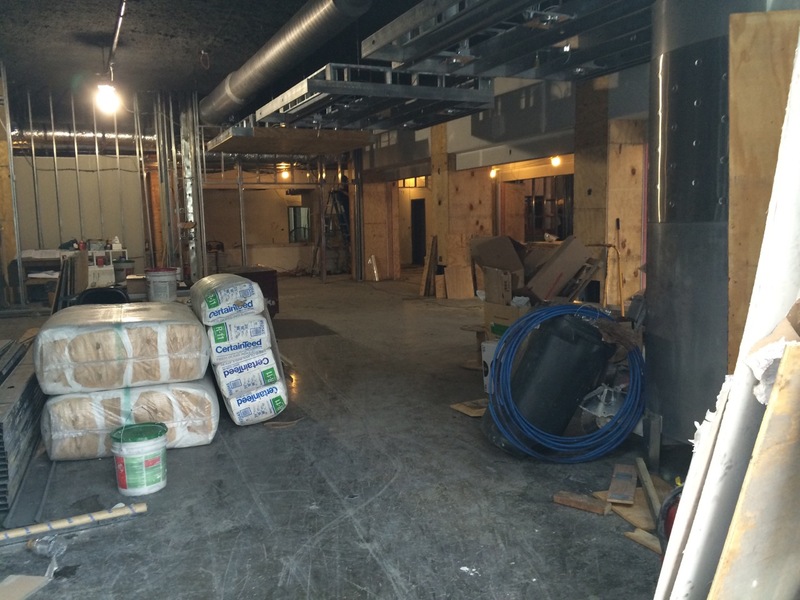 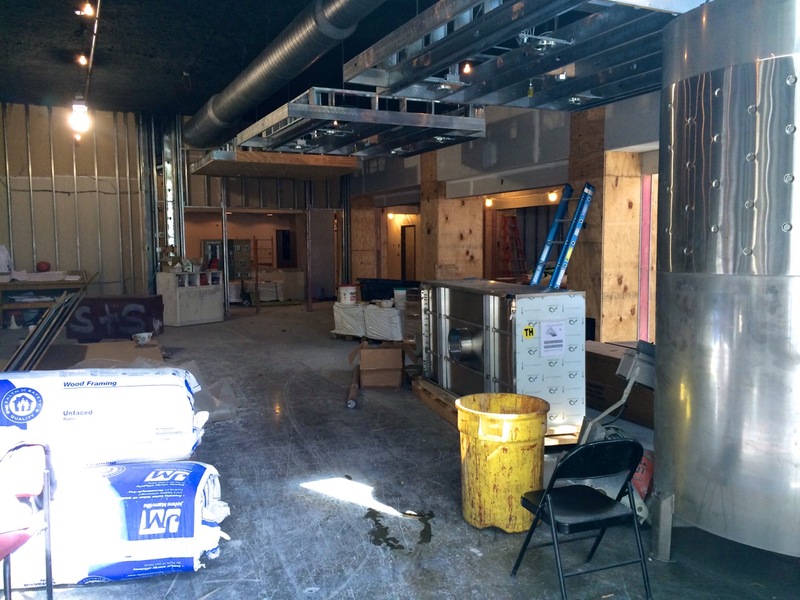 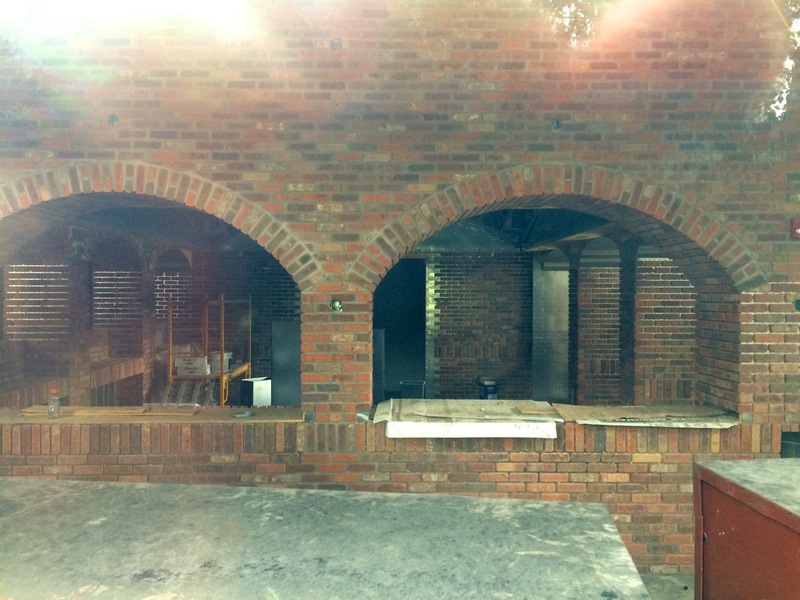 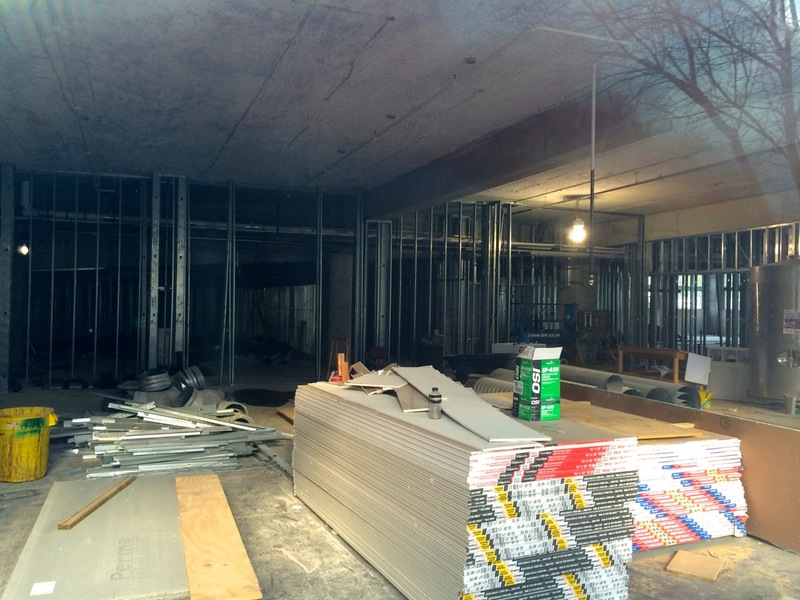 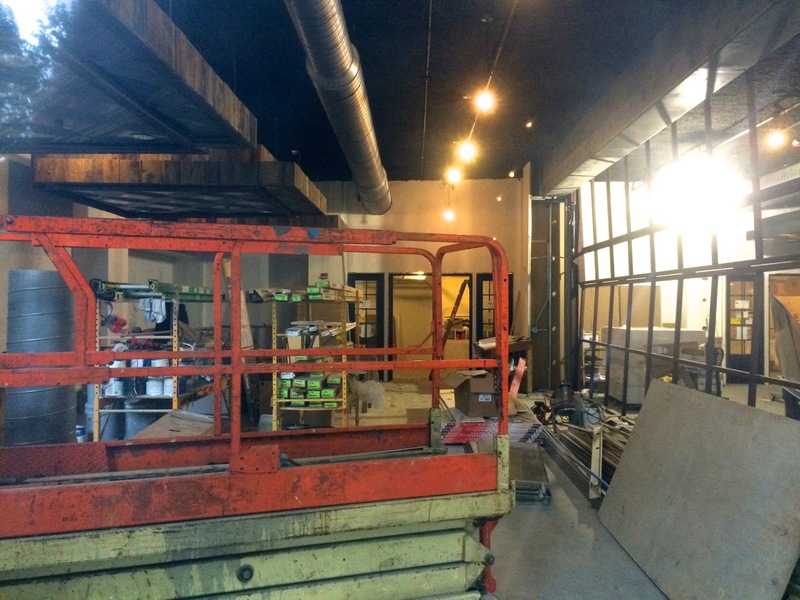 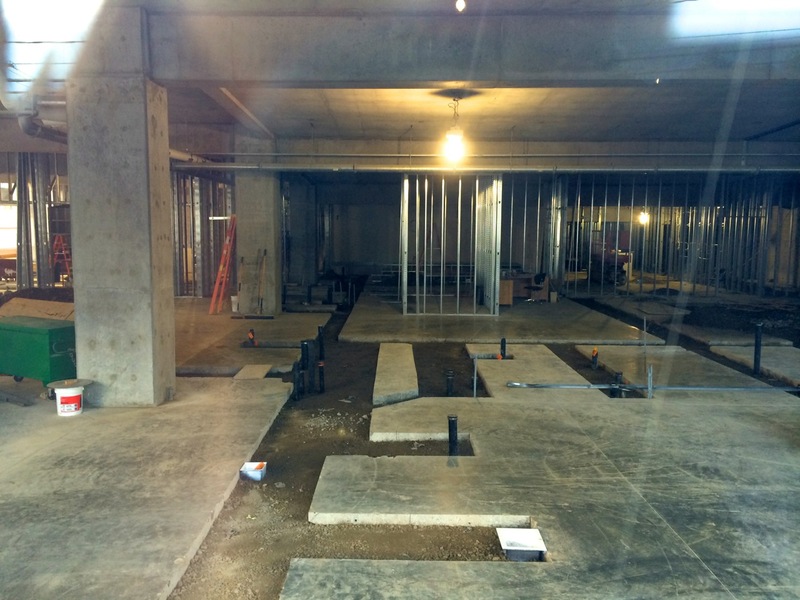 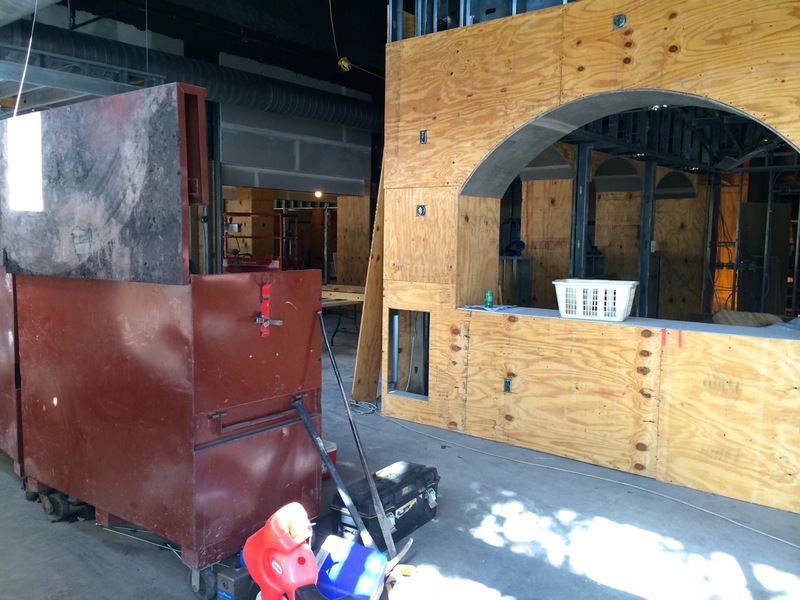 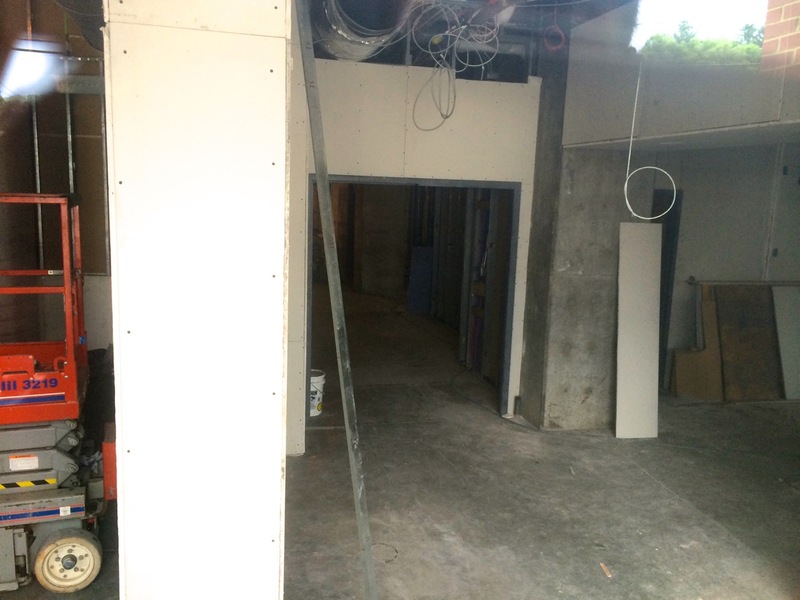 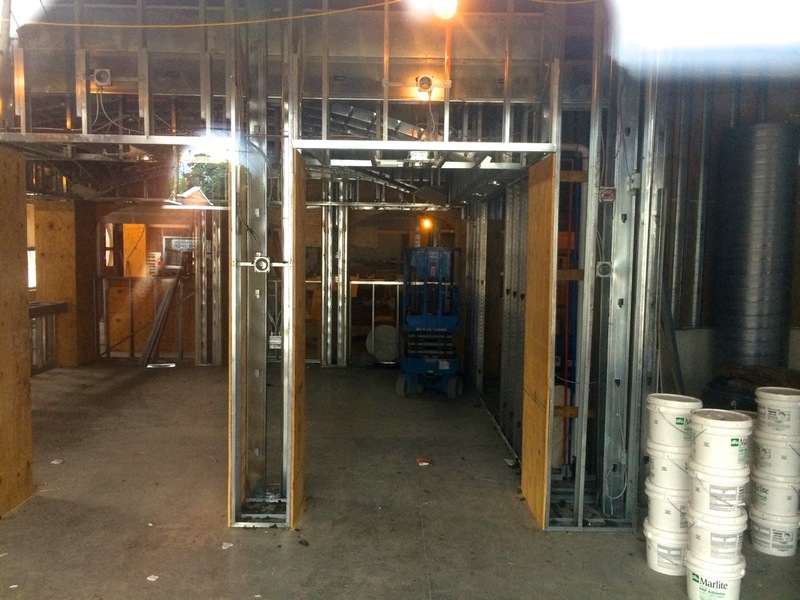 Walls have been framed-out, plumbing rough-ins look complete, but HVAC and electrical look to be in progress. 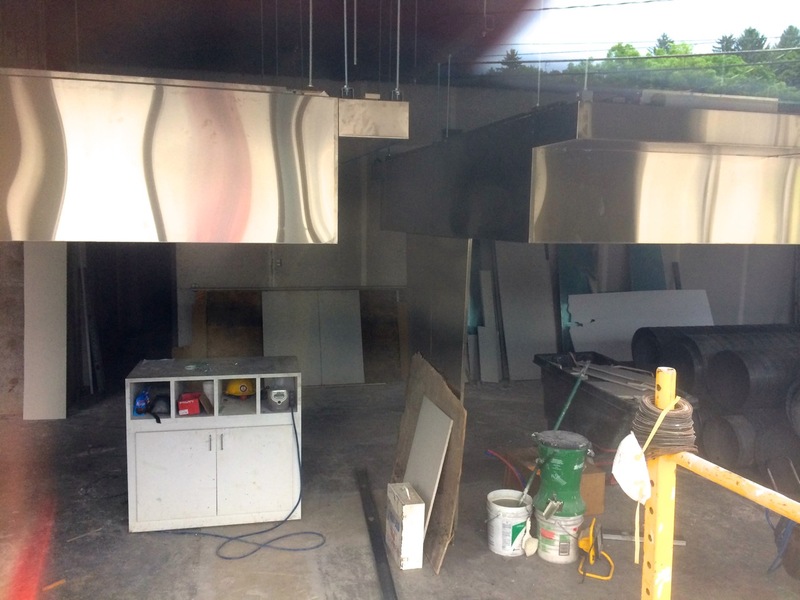 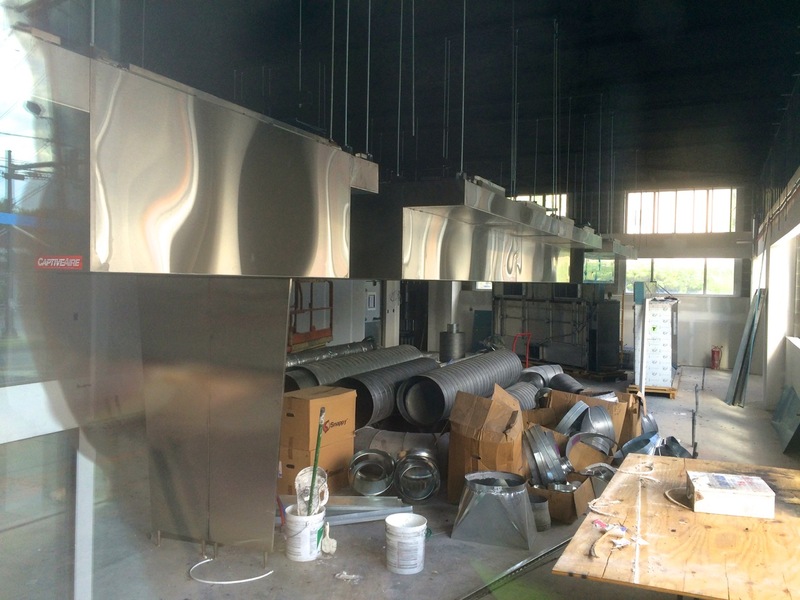 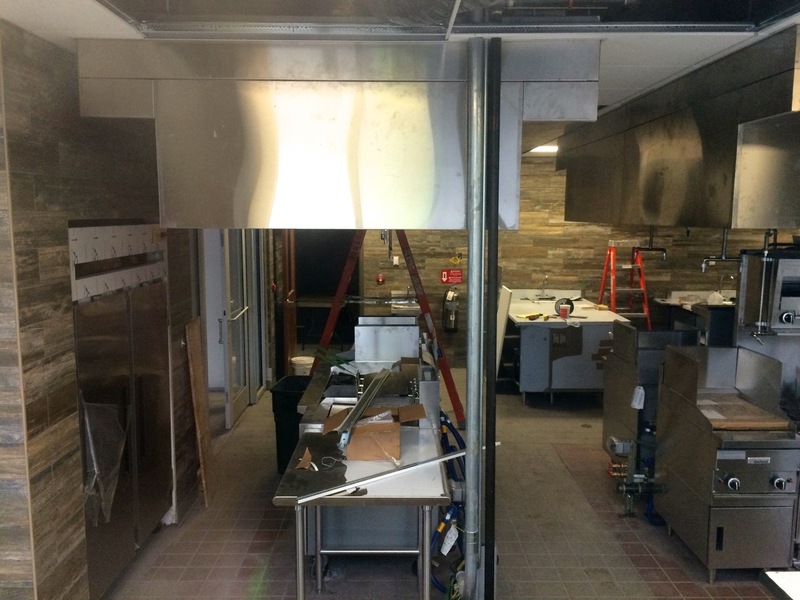 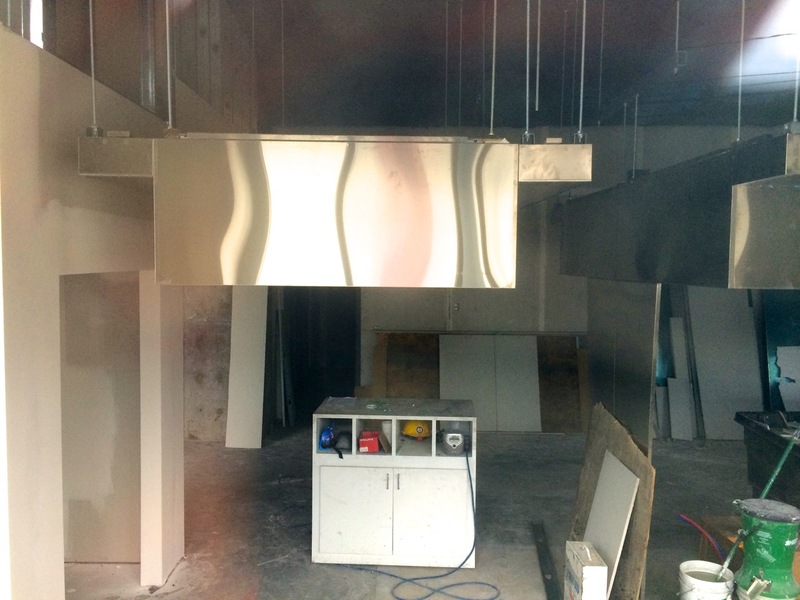 A few of the walls have been covered in drywall, and the large venting hood units have moved into the future cooking lab to be hung once the venting ductwork is run. 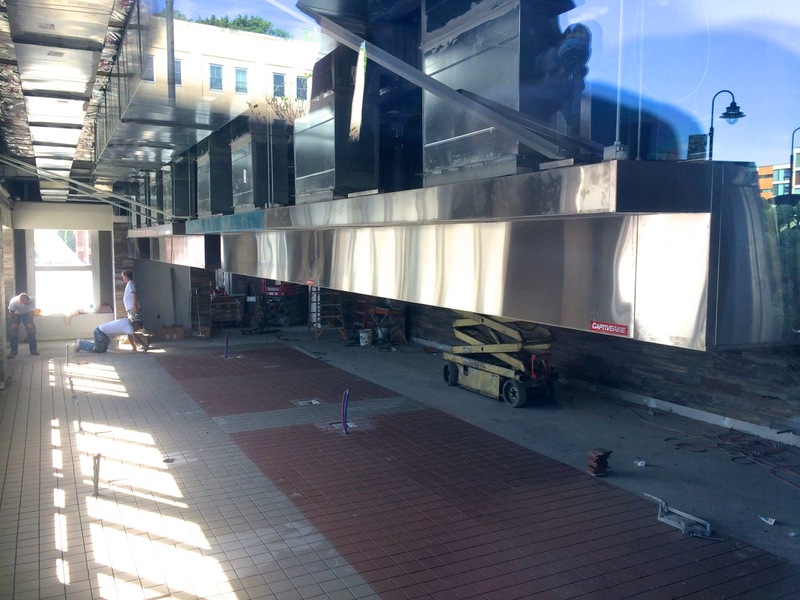 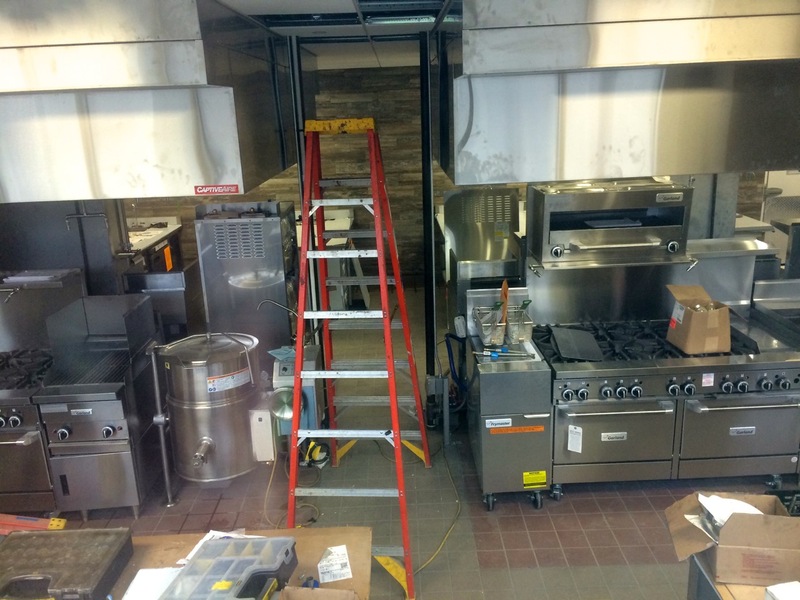 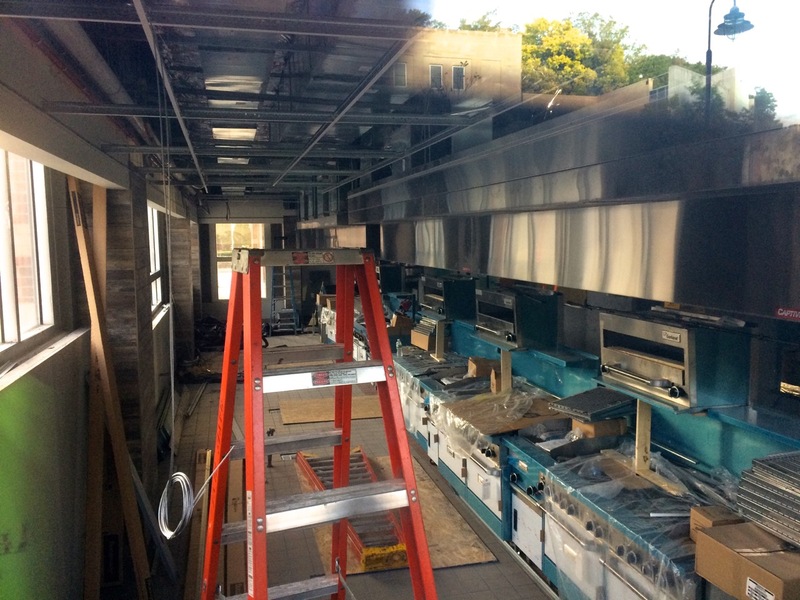 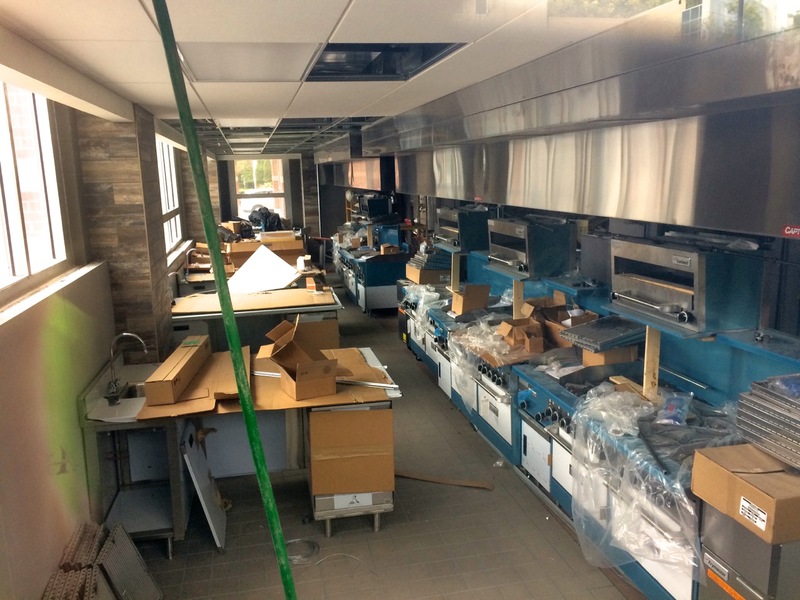 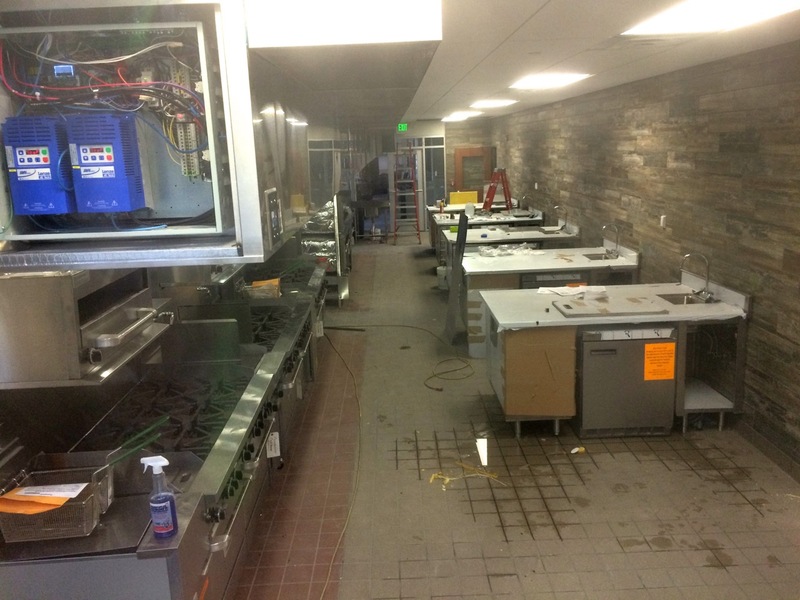 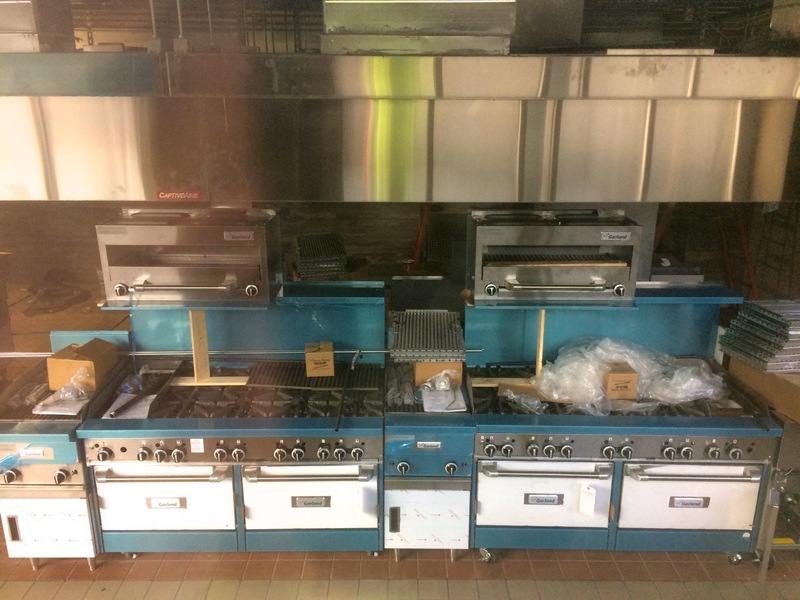 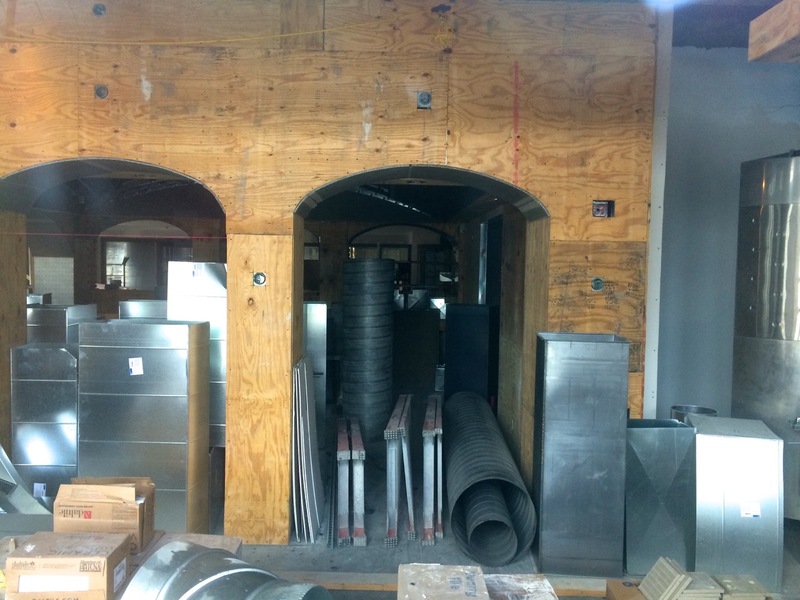 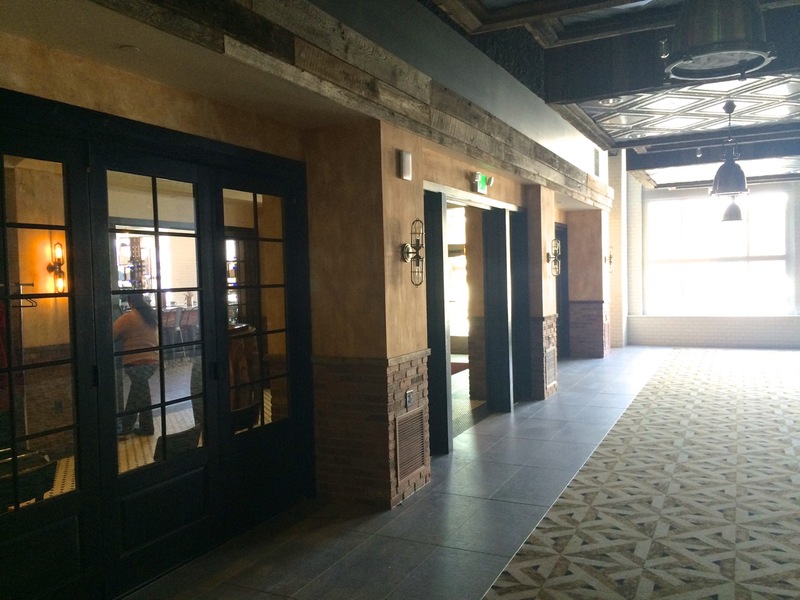 I’ve been told there are either 6 or 8 (can’t recall) cooking surface units for hands-on classes, and the layouts of the wine cellar/dining and reception areas have been altered since the original design. 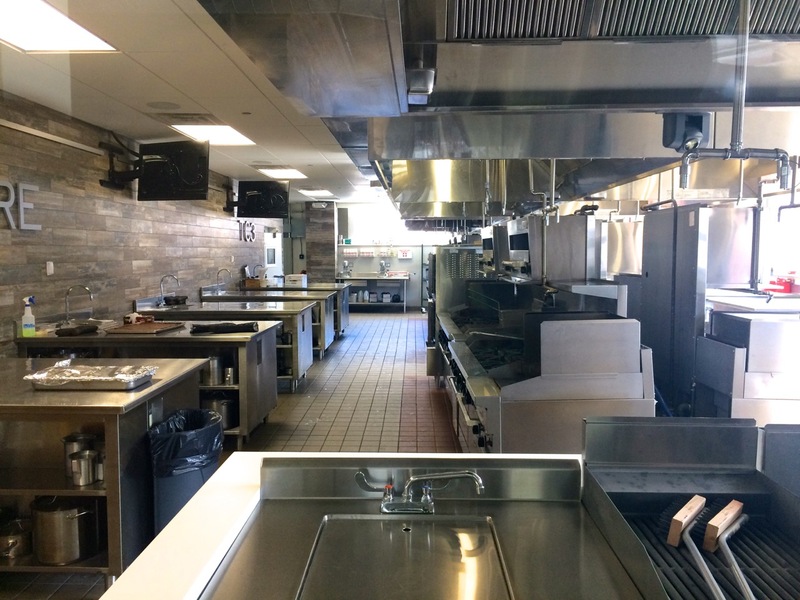 The video about the program is still up, which explains some of the background and intentions (there’s a farm out in Dryden where students learn the whole process from crop agriculture to plate). 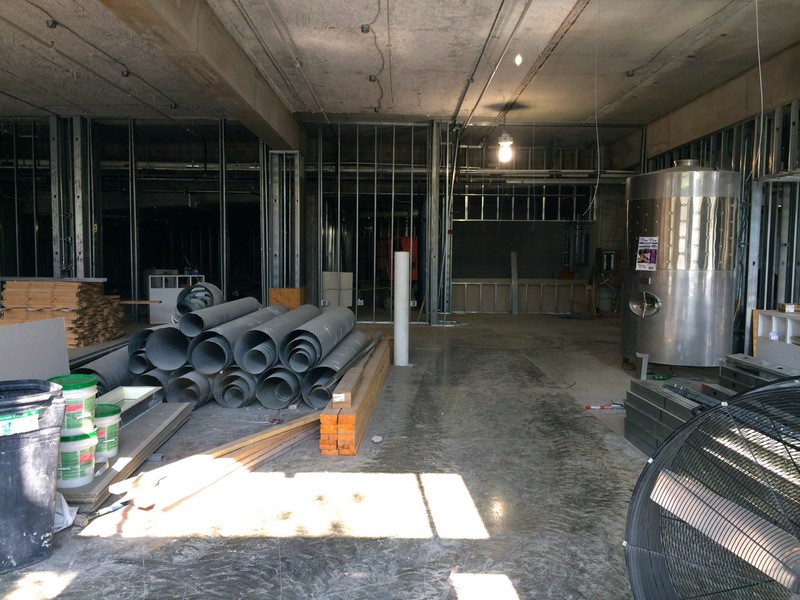 Updated photos here for the TC3 Farm-to-Bistro Coltivare project: more framing work complete, and most of the below-slab plumbing work has been closed-up and re-poured- you can see the hot and cold PEX supply lines sticking out, along with the new drains for various fixtures. 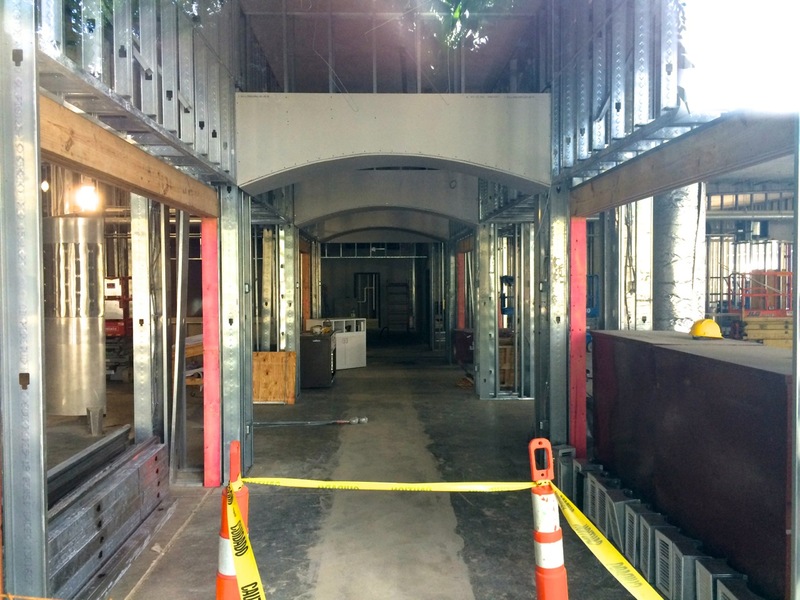 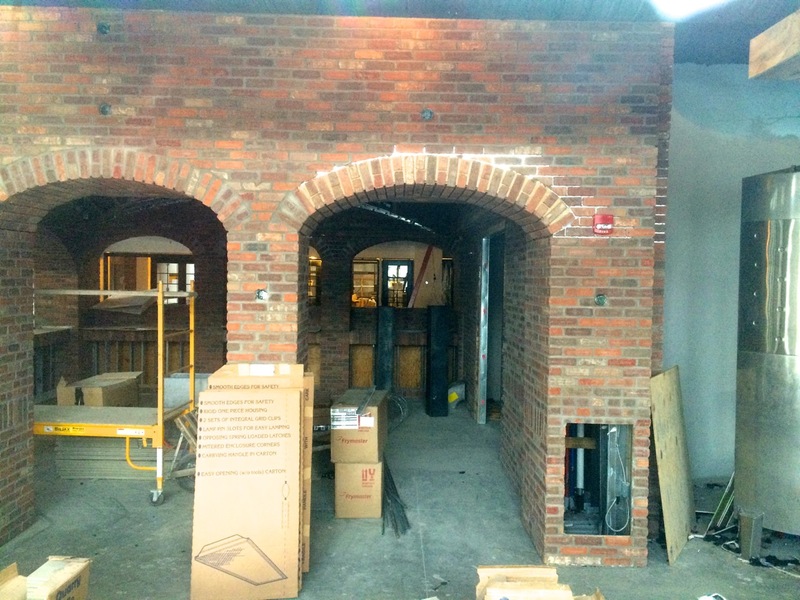 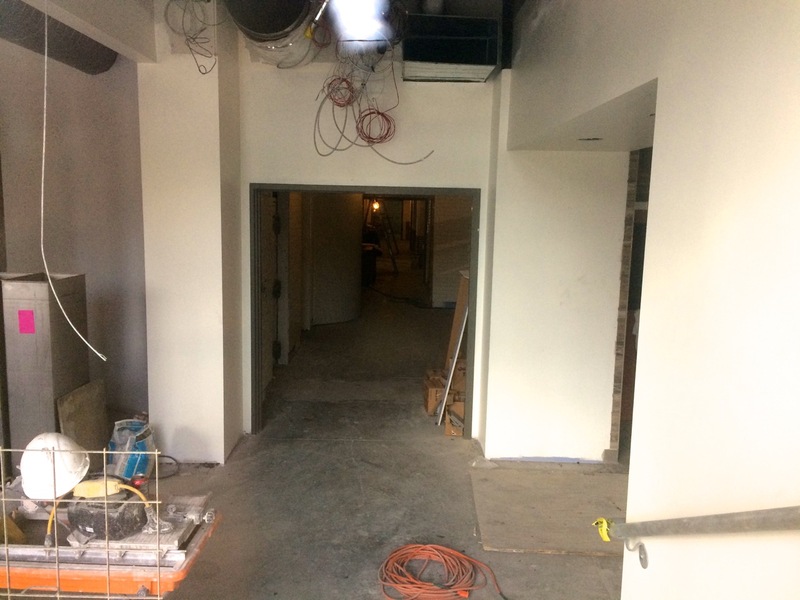 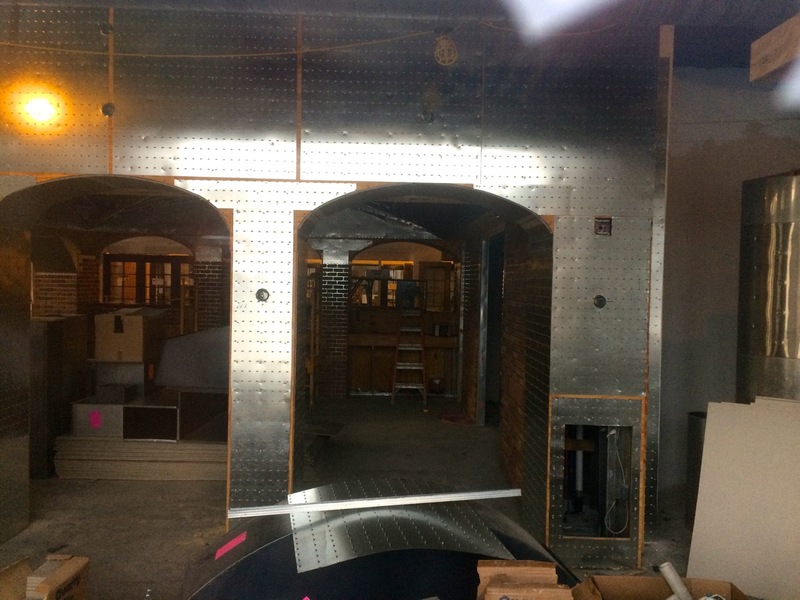 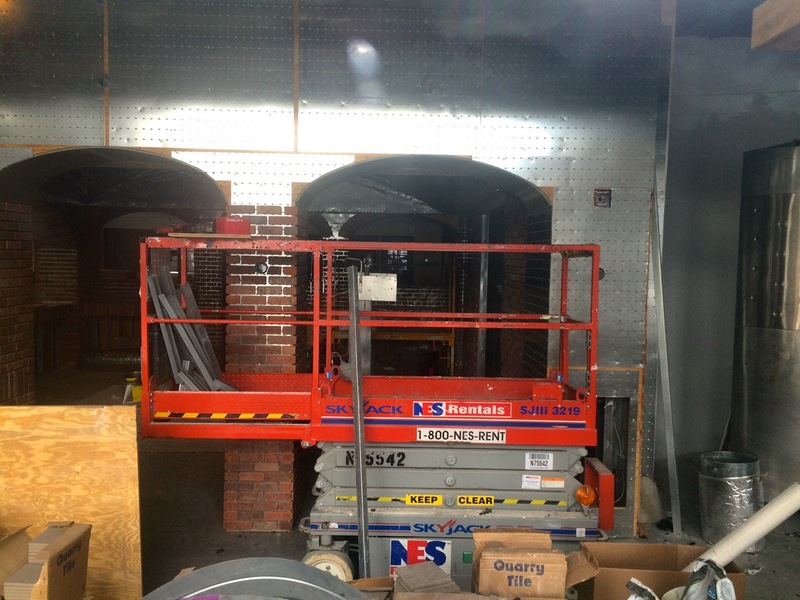 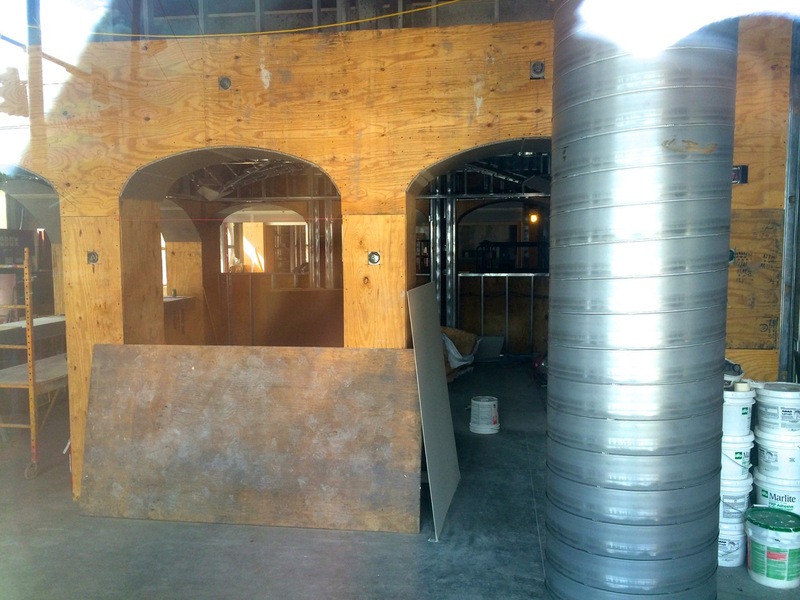 There’s a nice series of archways framed right at the main entry hallway, and we should be seeing electric rough-ins starting shortly, before the walls are closed-up with sheetrock later this summer. 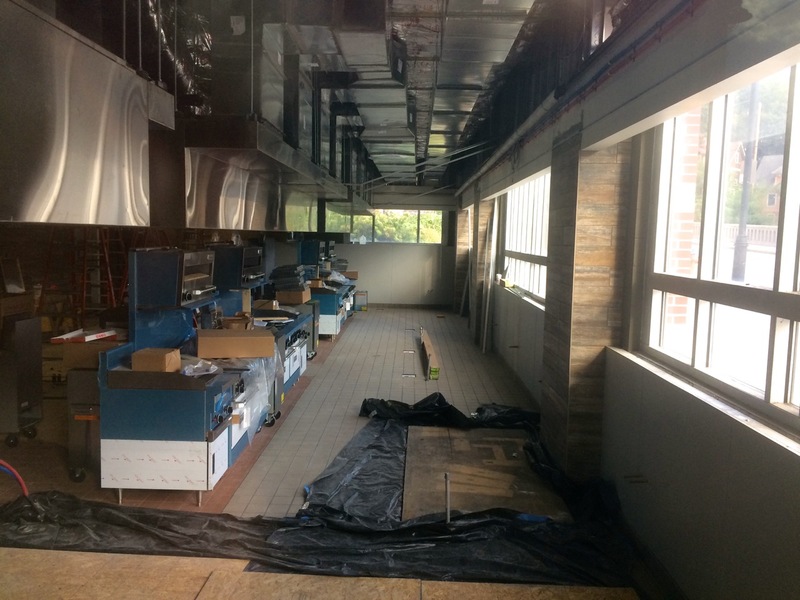 The Ithaca Times featured a great write-up about the culinary program and the space this past week: TC3’s ‘Farm-to-Bistro’ Program Takes Root in Ithaca, Dryden, and the previous post contained the link to the video explaining the program. 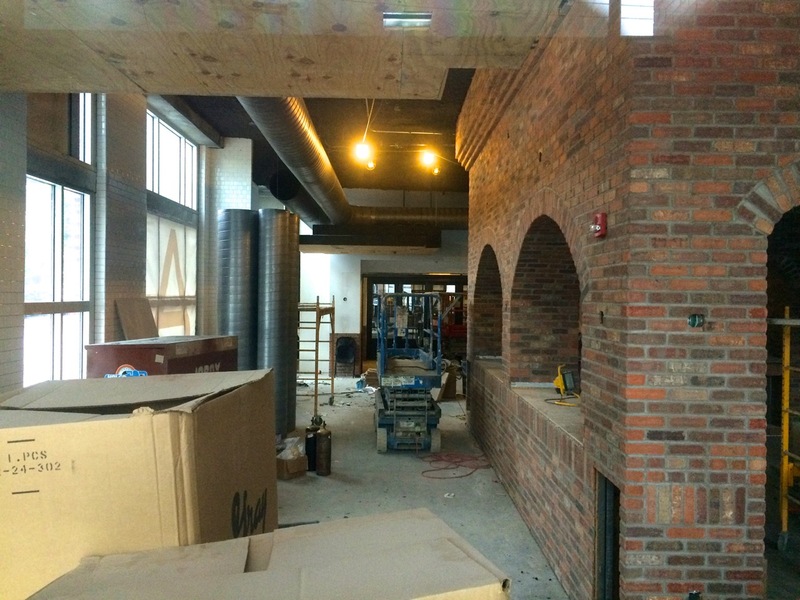 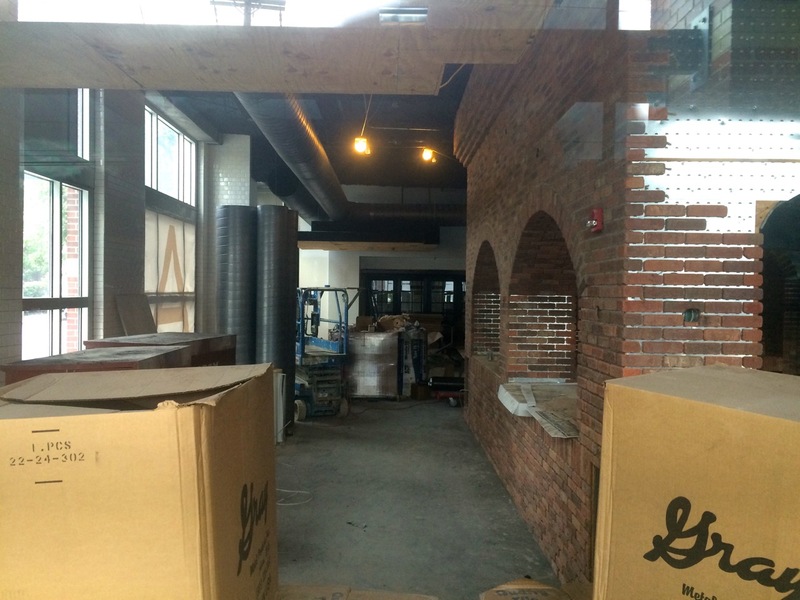 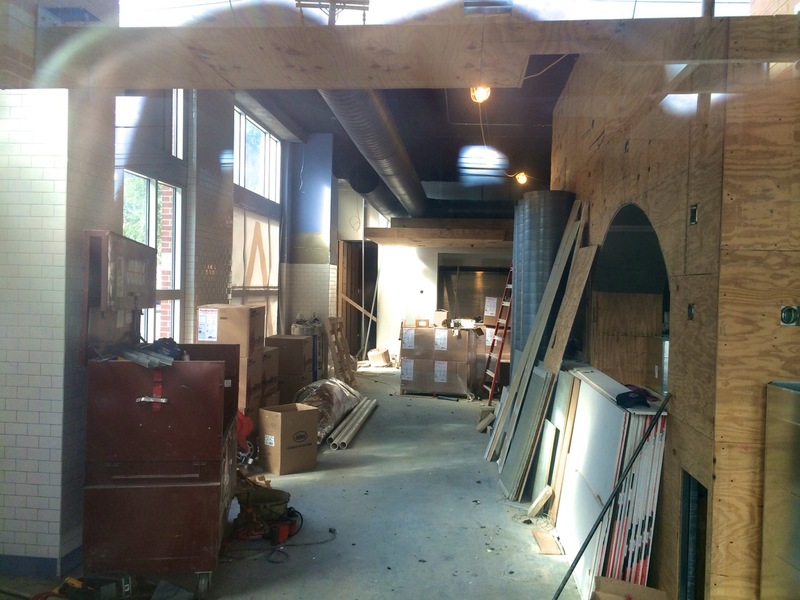 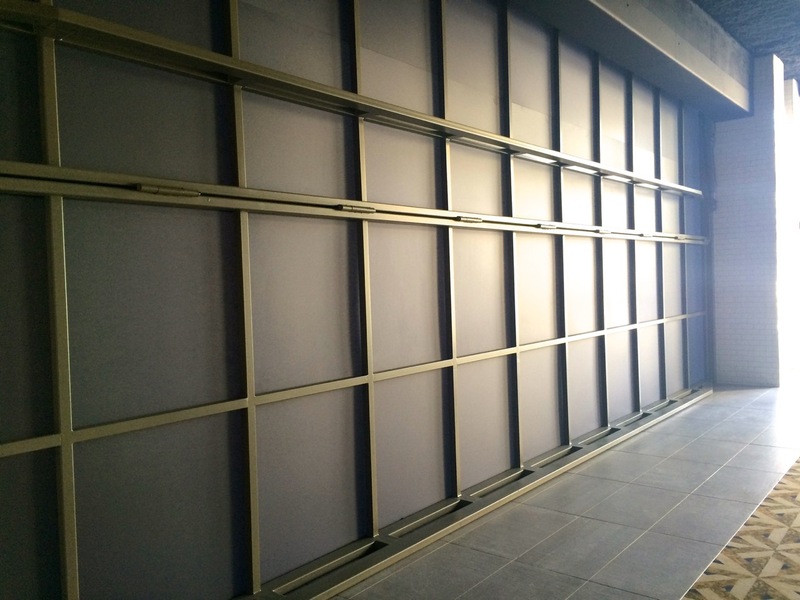 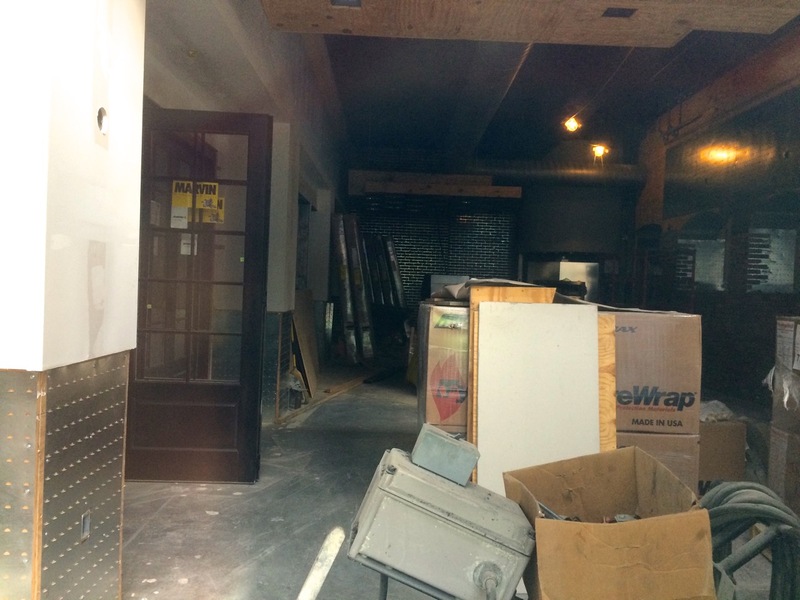 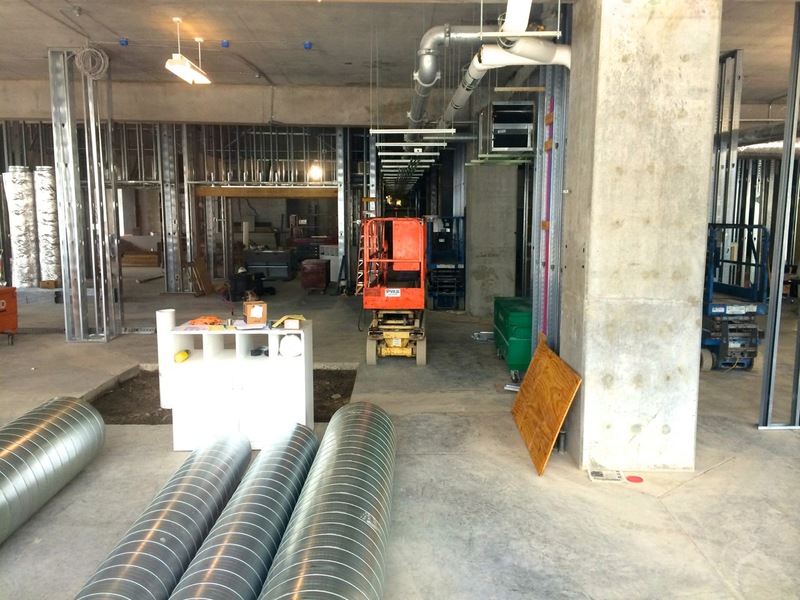 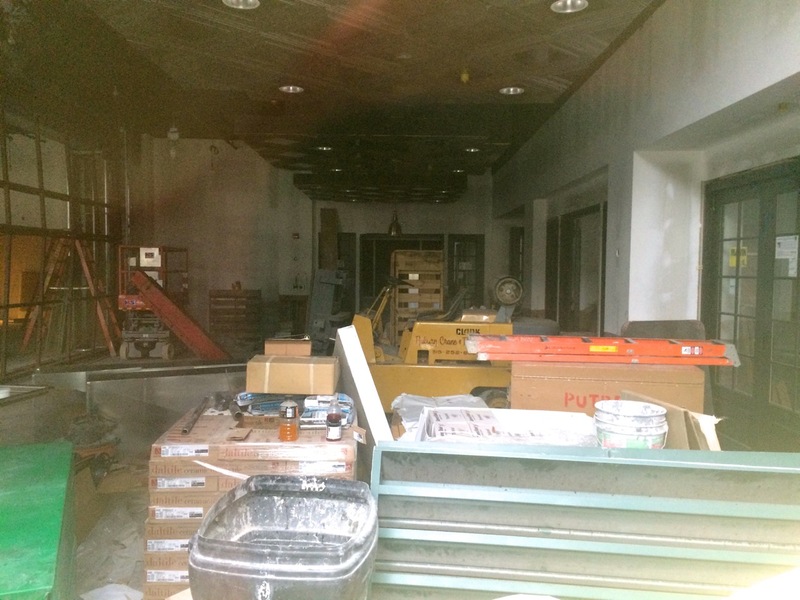 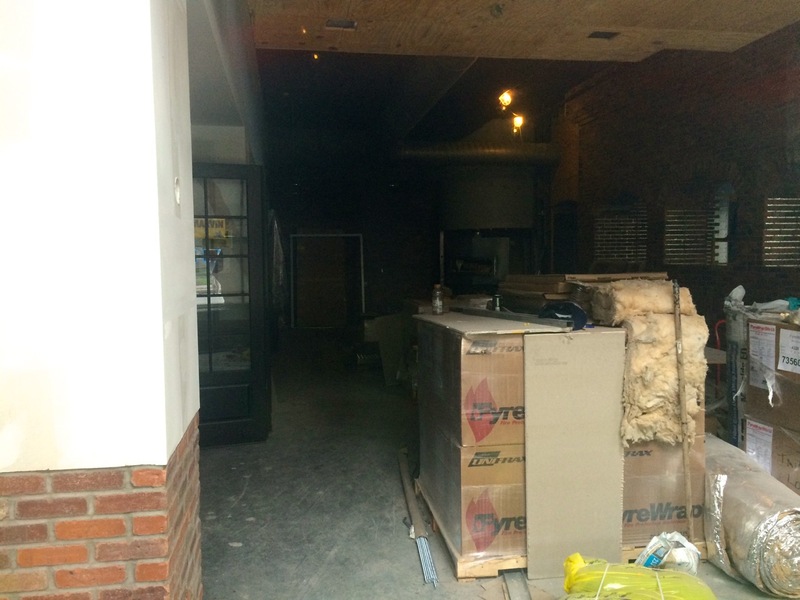 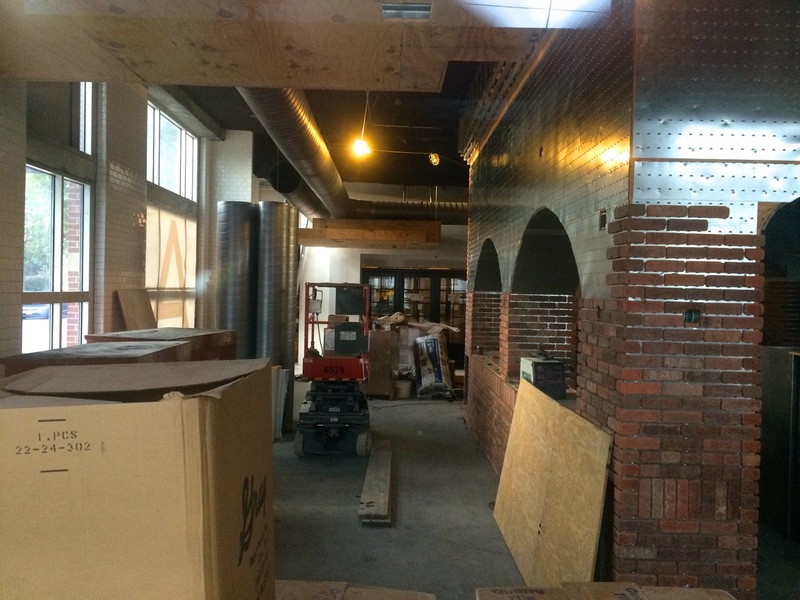 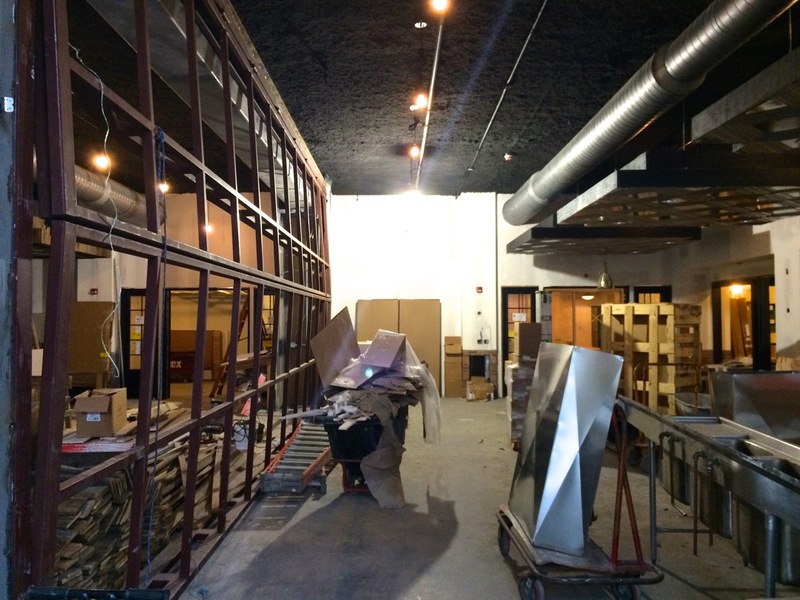 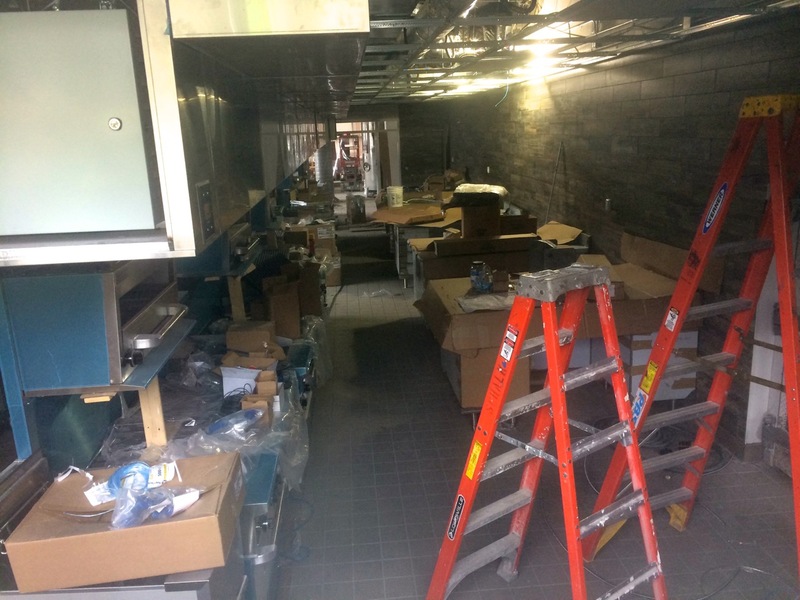 The buildout is on schedule for an early September opening. 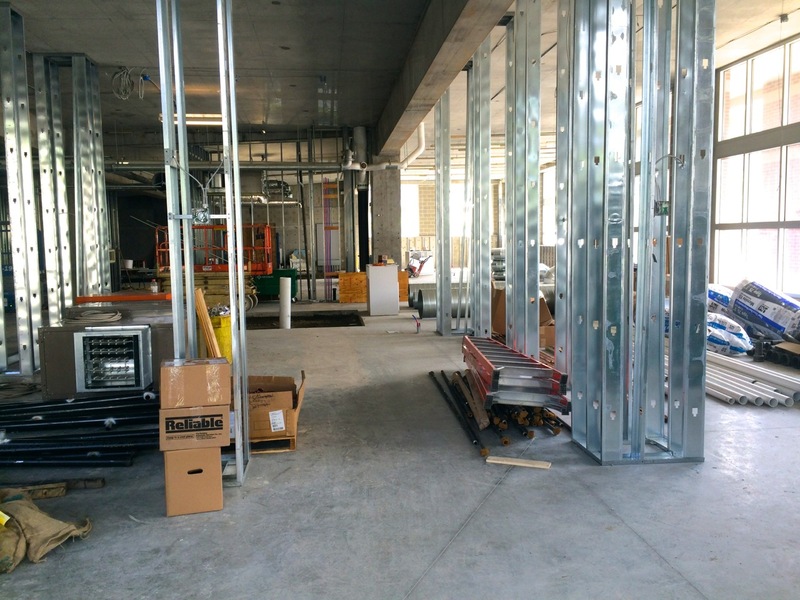 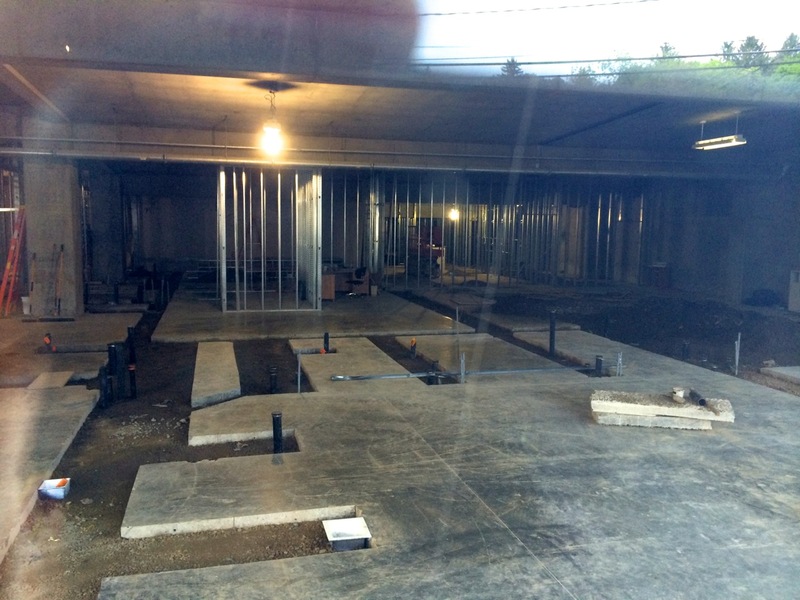 Tompkins Cortland Community College‘s 17,000 square foot Coltivare space inside the ground floor of the Cayuga Street Garage has been moving along with a ton of below-slab plumbing work, and metal stud wall framing. 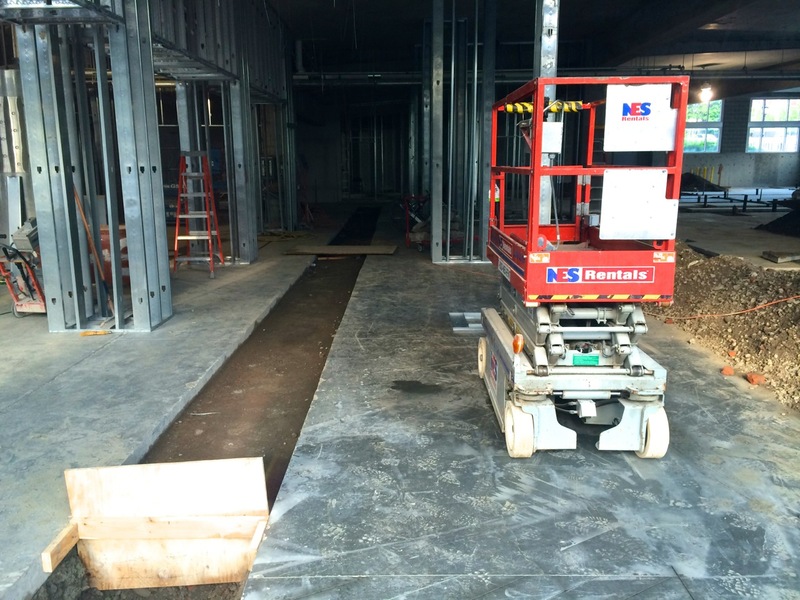 Cuts made into the concrete floor slab have been jackhammered out, dug, and pipes laid by HALCO Plumbing & Heating for a slew of drains that will serve bar, prep, kitchen, classroom, and restroom sinks and toilets. 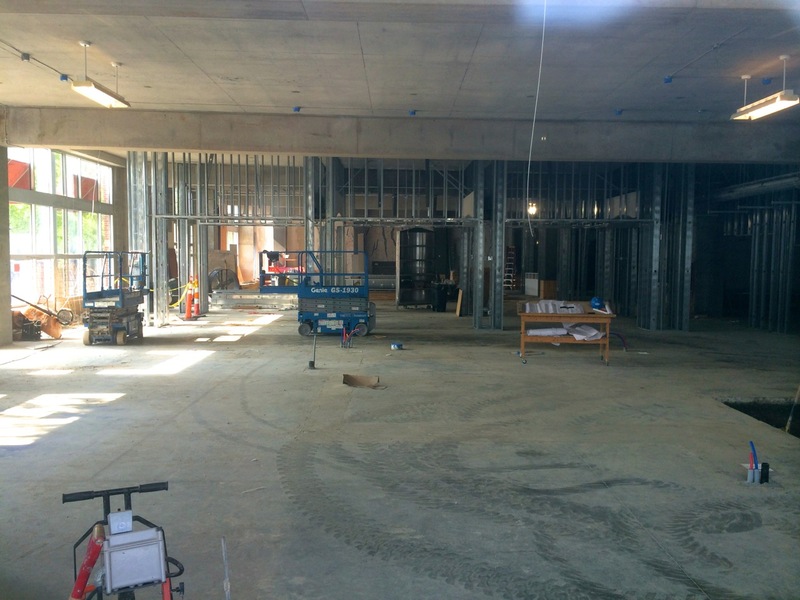 Due to the downward sloping ceiling deck in the back half of the space from south to north, the floor layout utilizes the lower-clearance space for storage, then restrooms, then classroom space towards the southeast. 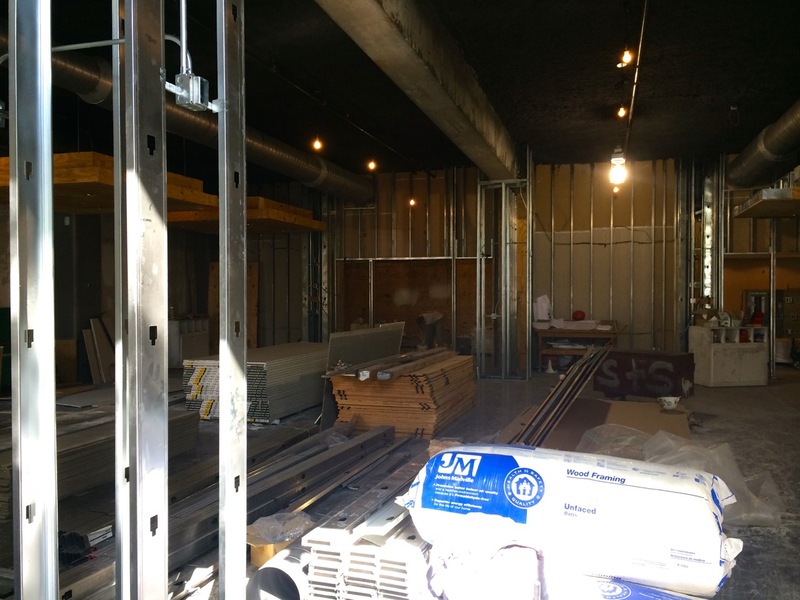 The southwest to center-west portion will comprise the public restaurant, along with ample outside seating along the corner and following East Clinton Street. 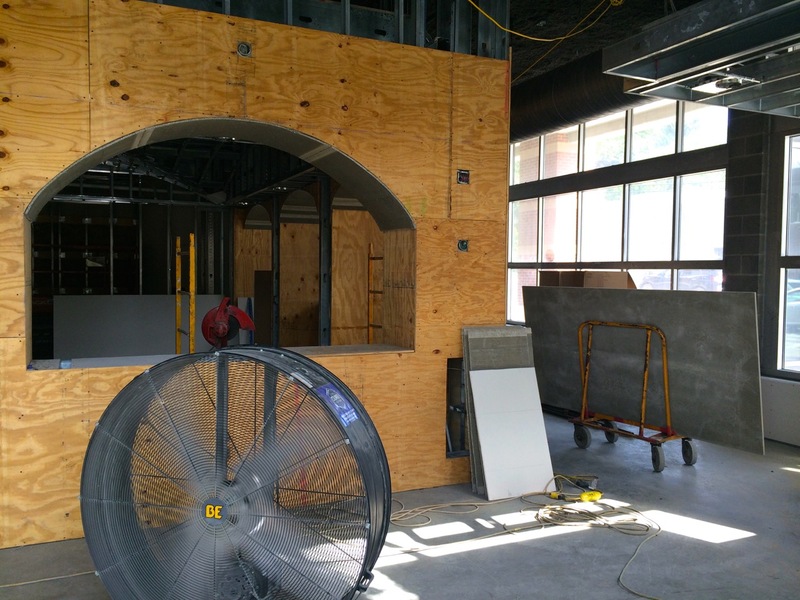 The plan is to be ready and open this August, in time for the Fall semester. 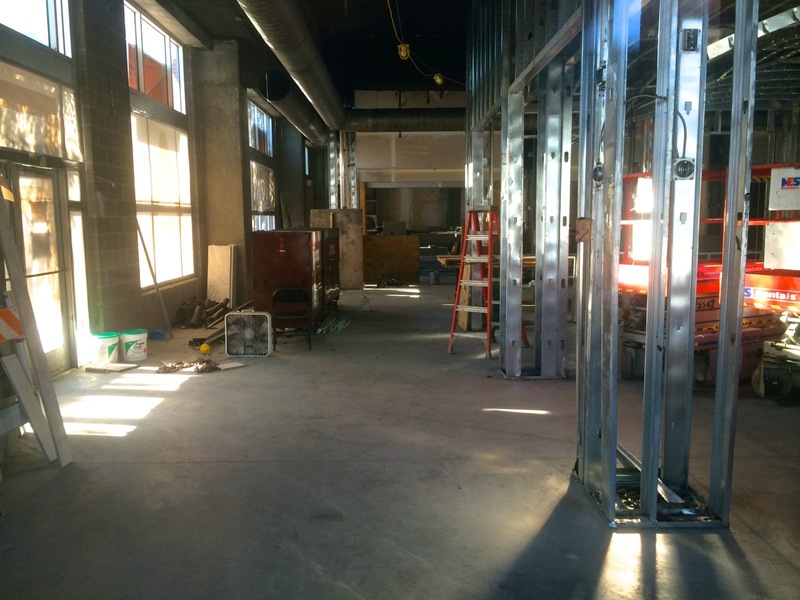 The design for the space is by Ramsgard Architectural Design, with general contracting services by Turnbull-Wahlert. 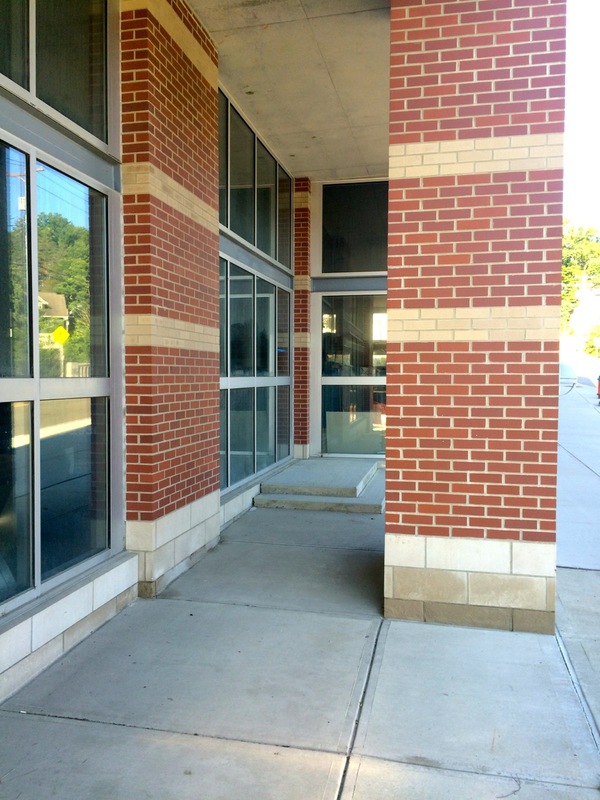 Along with Coltivare, this corner of Ithaca will be seeing quite a transformation with the addition of the 39-apartment unit Cayuga Place Residences over the course of the next year. 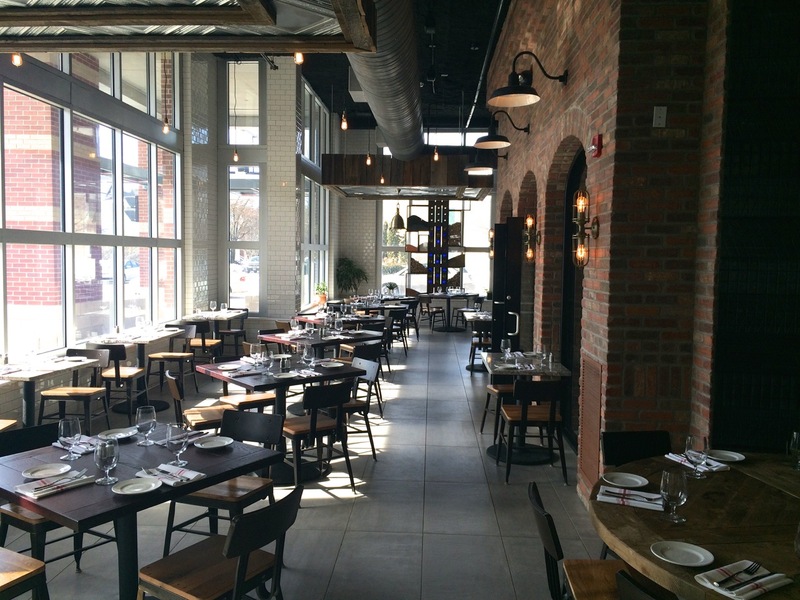 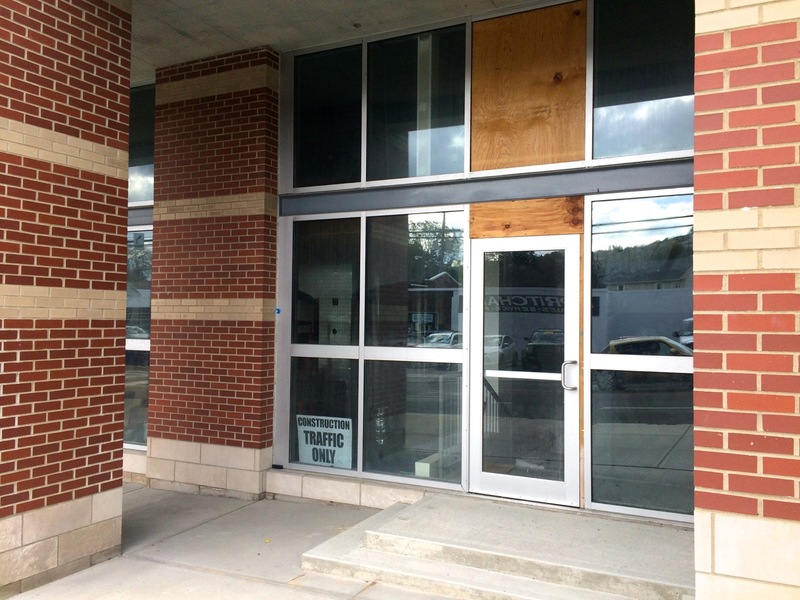 TC3’s Farm to Bistro space Coltivare will be big: the plans are to take up the space of the former Finger Lakes Wine Center and the adjacent vacant first floor commercial space, which comprises the rest of the available retail space in the Cayuga Street Parking Garage. 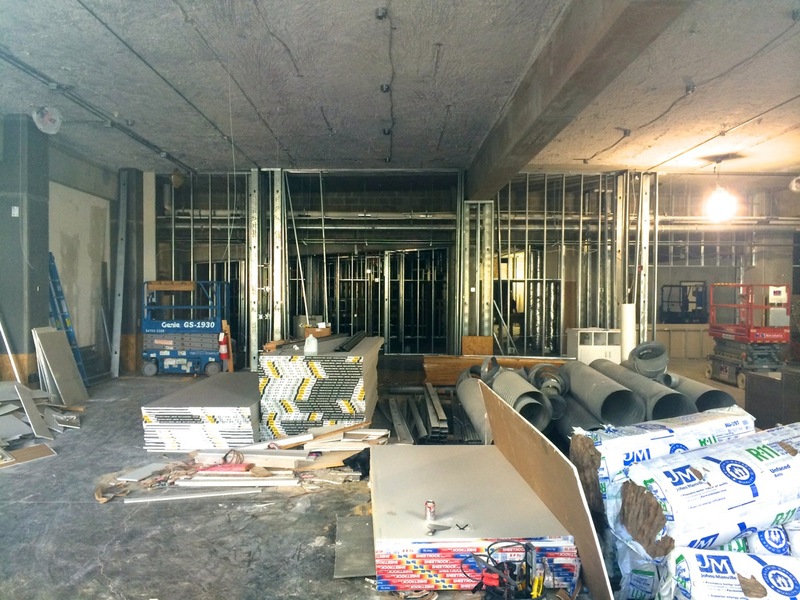 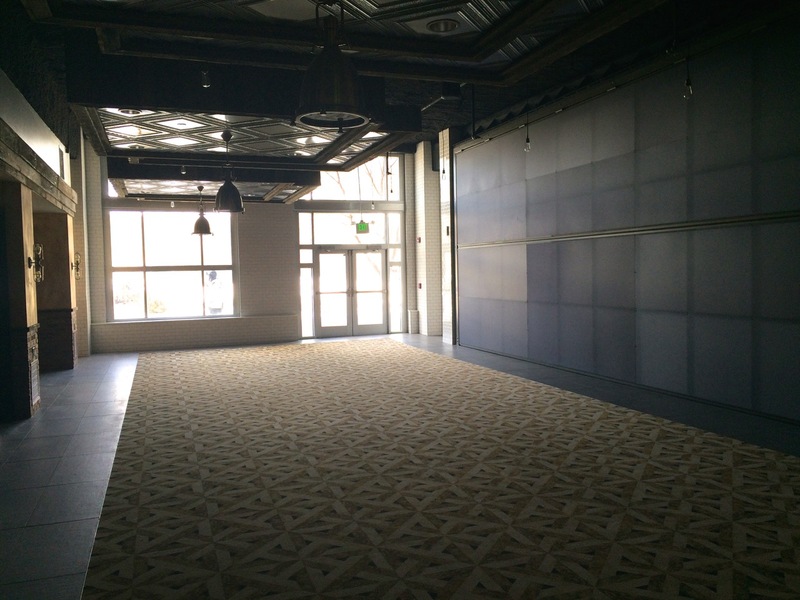 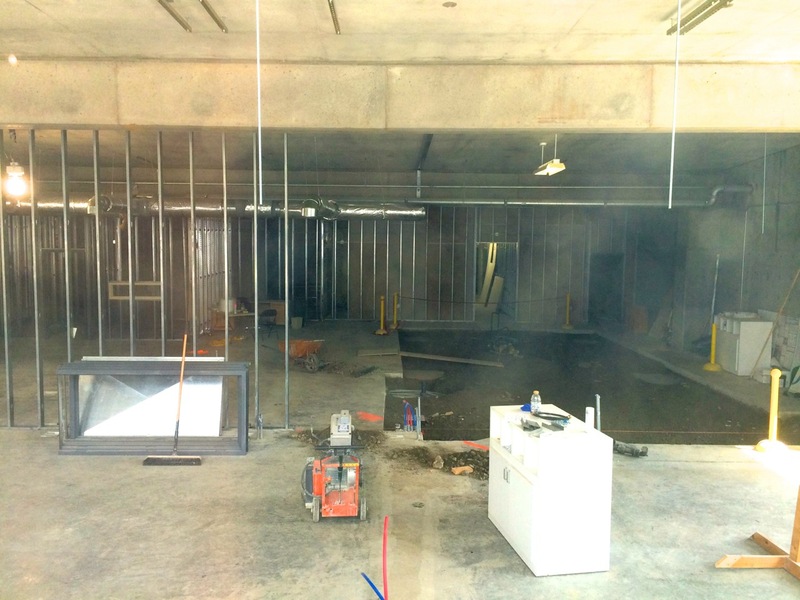 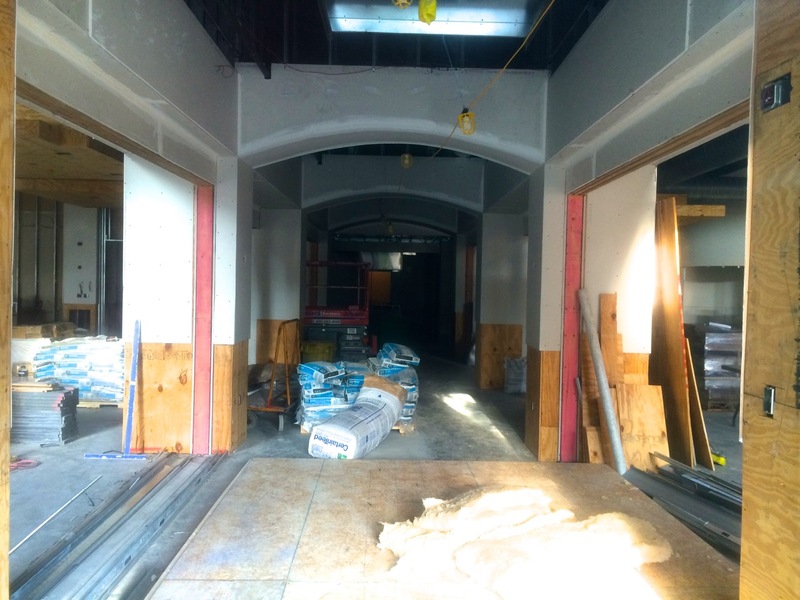 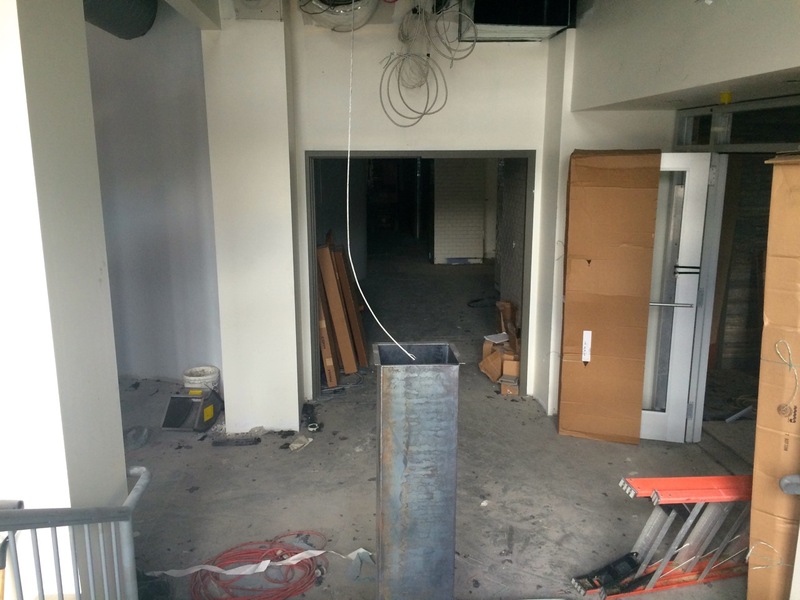 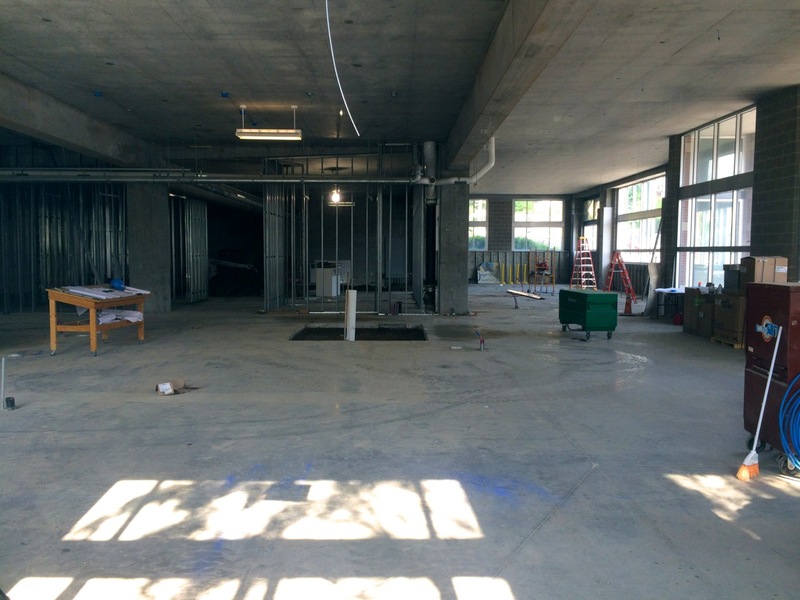 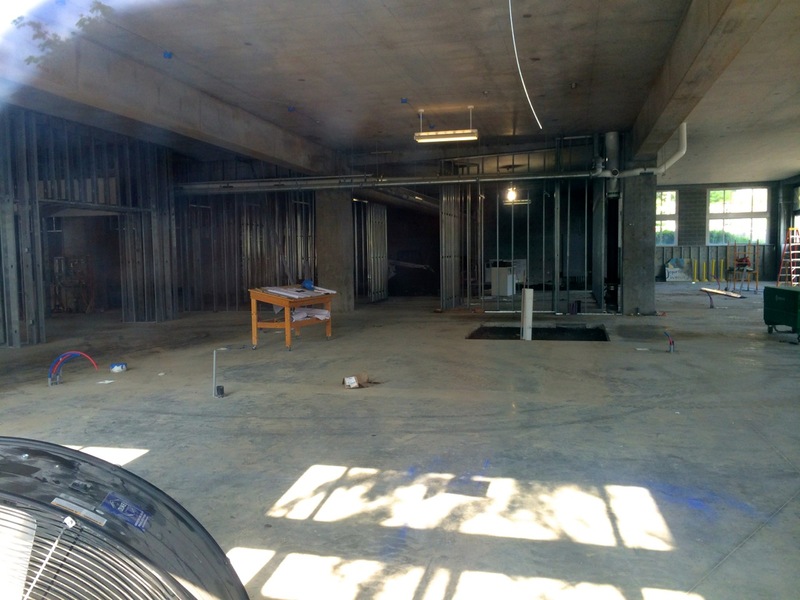 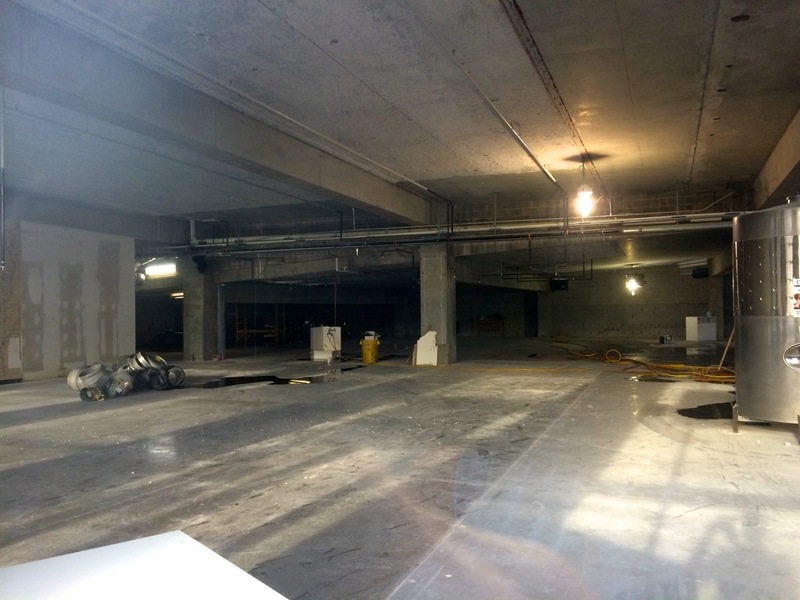 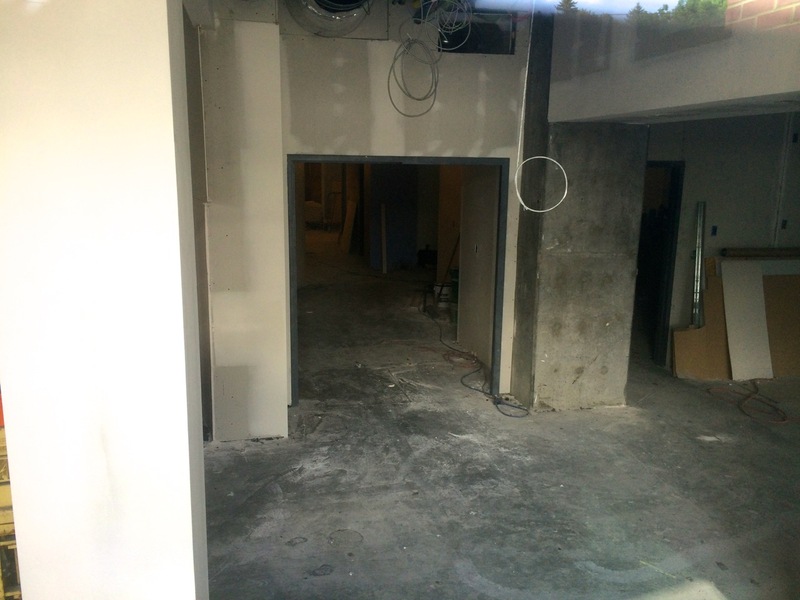 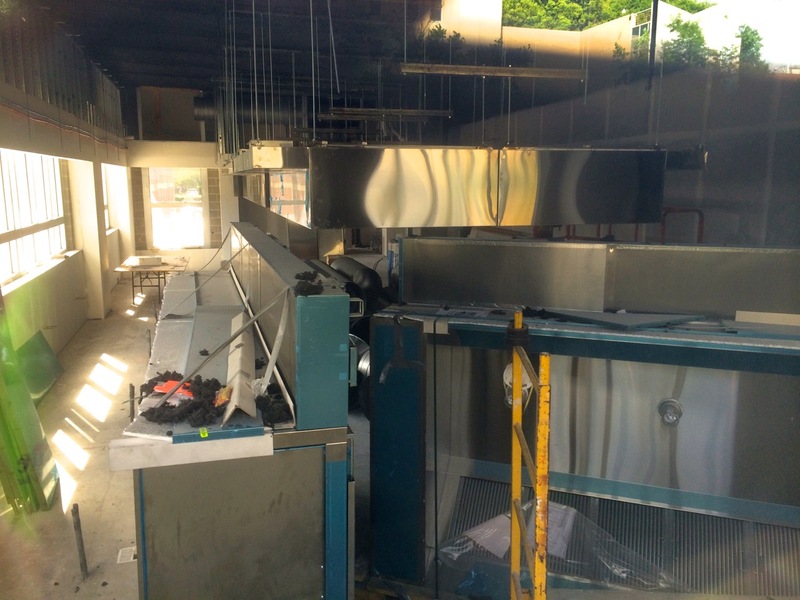 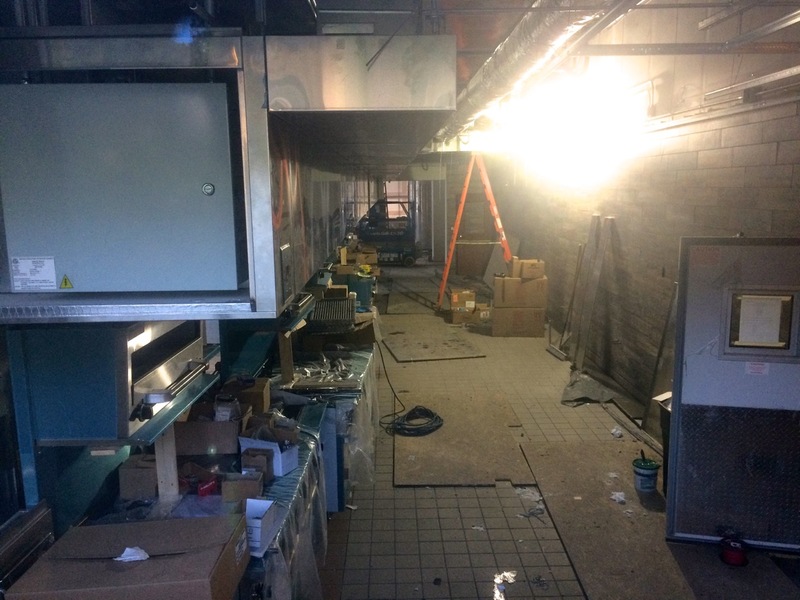 The former Wine Center has been demoed-out, along with the partition wall, so beyond the raw concrete ceilings, walls, and existing utility runs, the space is totally bare. 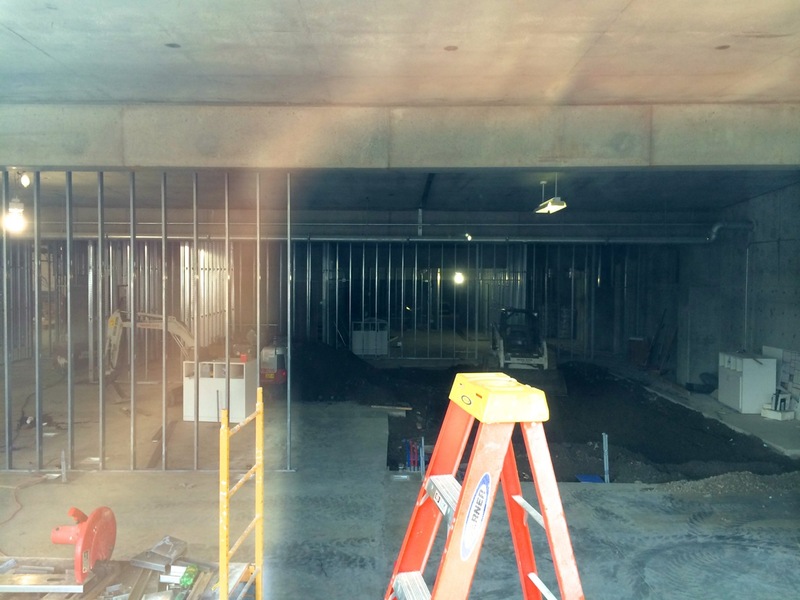 The ceiling towards the eastern half is slightly angled due to the slopes of the garage ramps. 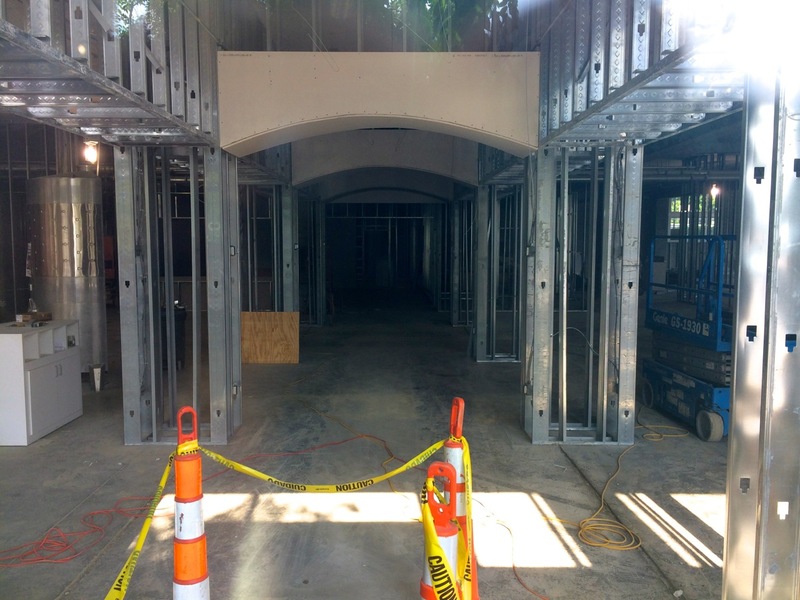 The general contractor is Turnbull-Wahlert Construction, based out of Cincinnati, Ohio, and sub-contractors will include several local and regional companies. 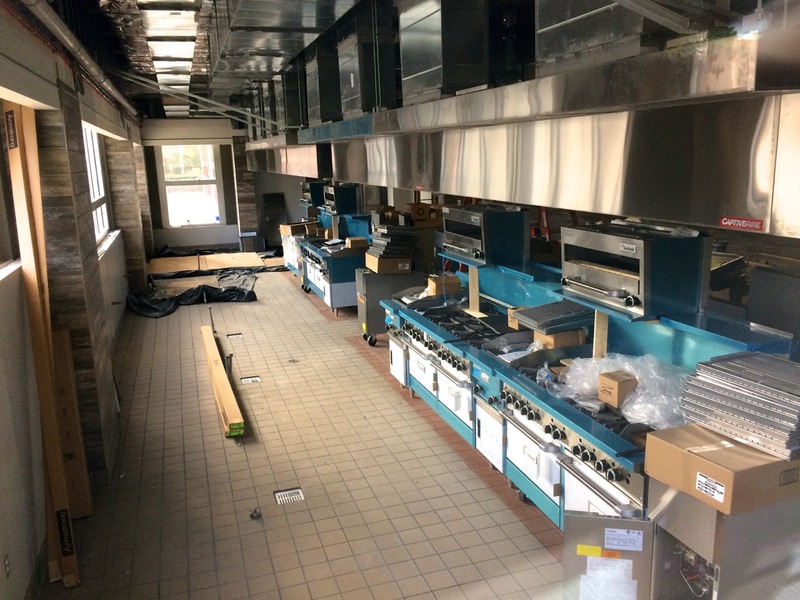 Tompkins Cortland Community College (TC3) is making a bold expansion in downtown with a farm-to-bistro concept, a fitting launch to their Culinary Arts Program (TC3 currently leases space in the Tioga Place Building for their Extension Center). 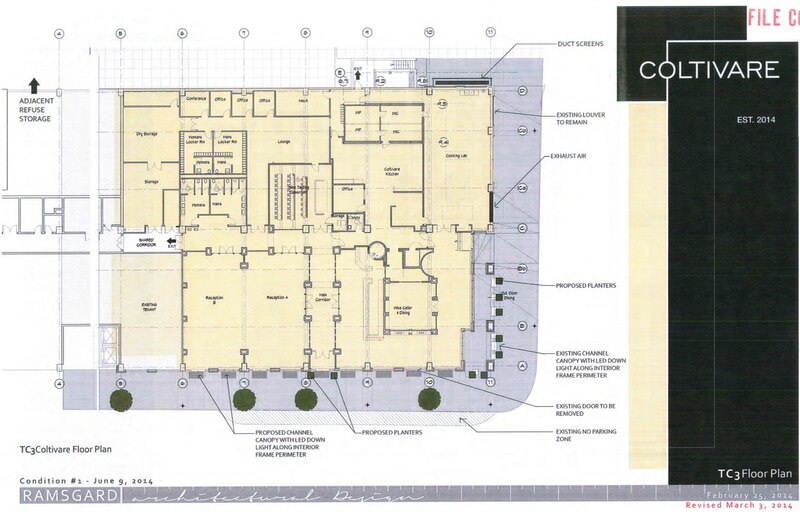 Here are some shots of the site plan review materials, showing the facade plan for the Cayuga Street Garage ground retail space at the corner of Cayuga Street and Clinton Street. 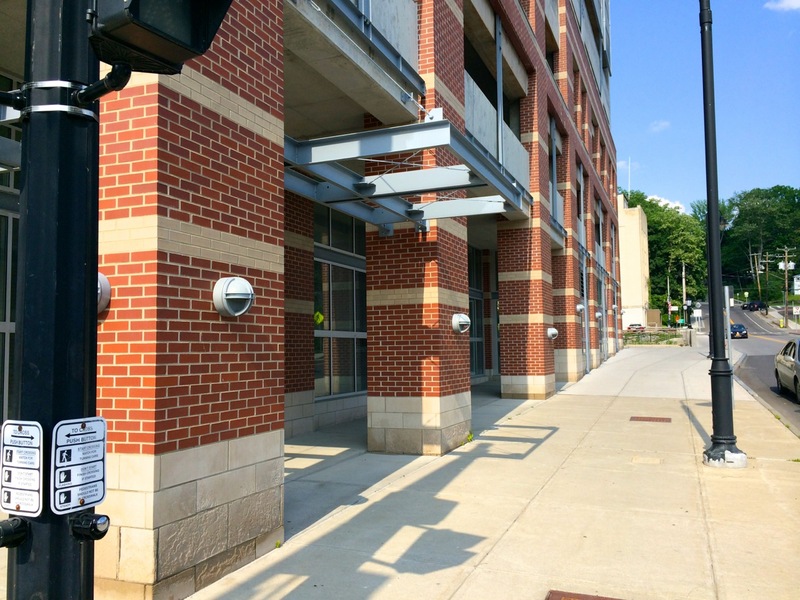 The garage parcel is owned by the City of Ithaca, and was leased to the Ithaca Urban Renewal Agency (IURA) in 2003 for a 40 year term. 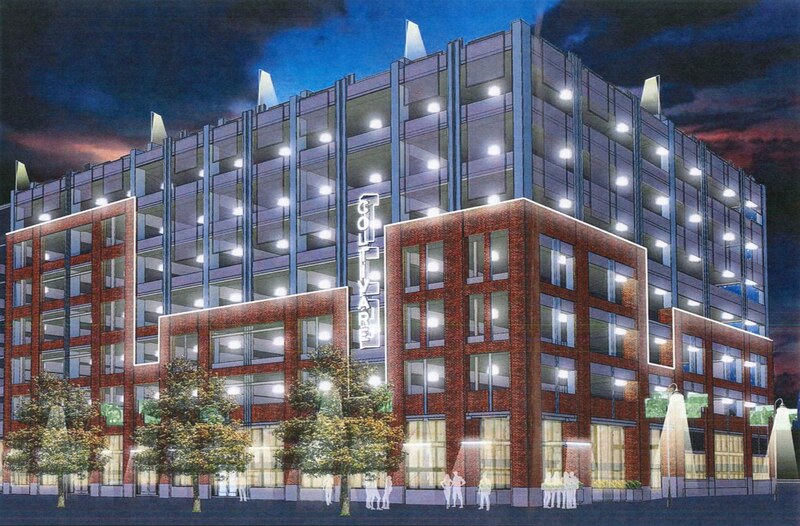 The IURA partnered with the National Development Council to redevelop as a mixed-use parking garage, in order to fulfill parking demand, but also to provide ground level retail and office space. 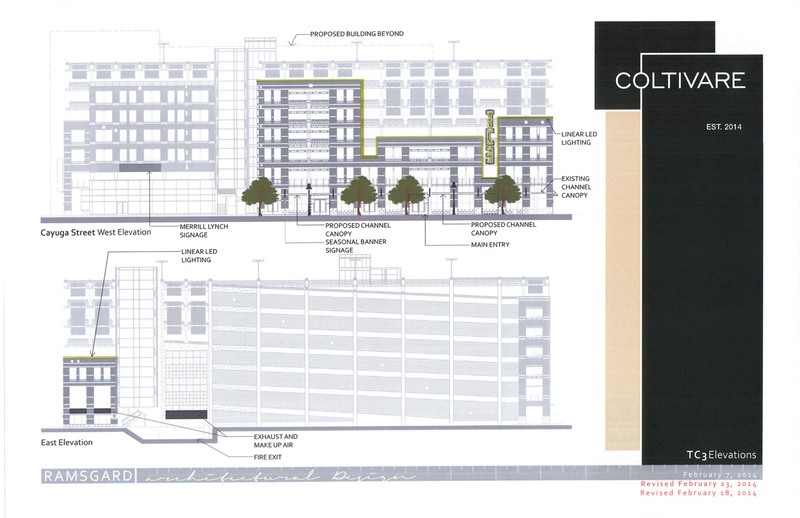 Bloomfield/Schon’s adjacent Cayuga Place Two Project (also Cayuga Place Residences) will be breaking ground this year, as sub-contractors are currently submitting bids. 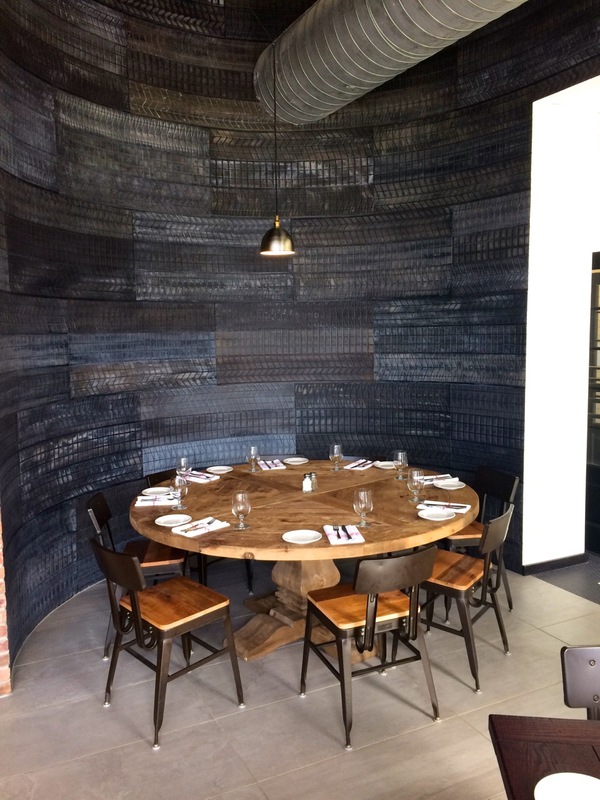 The designs are done by Andrew Ramsgard of Ramsgard Architectural Design, an architect whom has done design work for a host of projects, especially restaurants, including Agava.